The summer of 2014 is at an end. In Colorado it was a wet one. 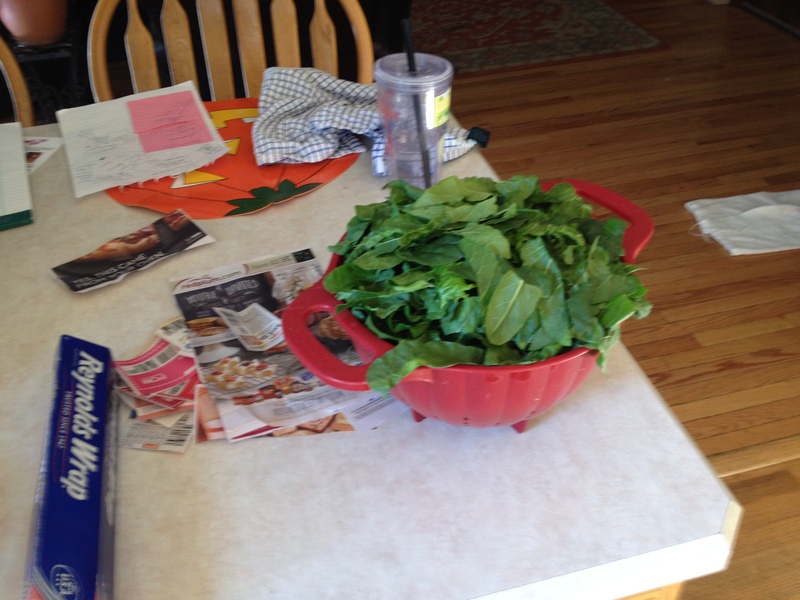 The garden did well this year. 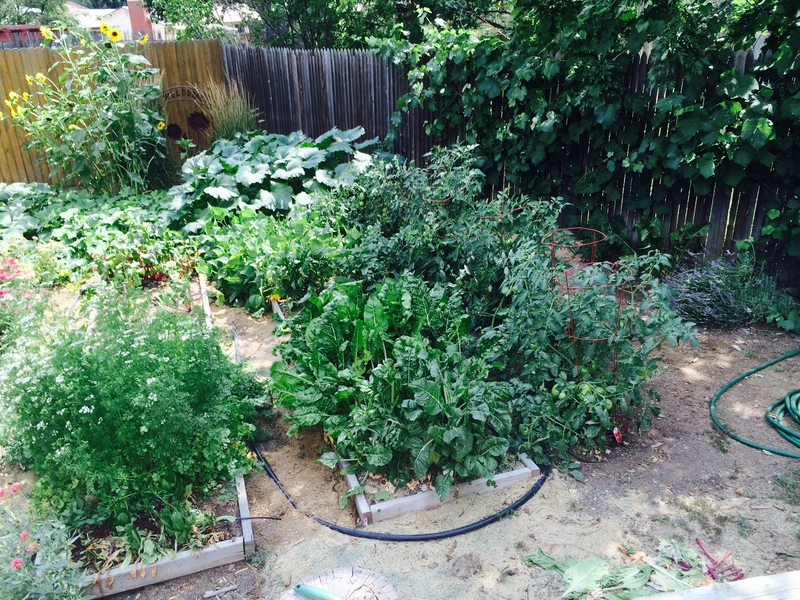 I kept up with the produce but I invited neighbors and friends to stop and “shop” as well. Joy said this was better than the grocery store because she could come in her nightgown. I used this batch for a zucchini chocolate cake with a chocolate cheese frosting. I forgot to get a picture, but I’ve made the cake for two potlucks. At Mary Beth’s Labor Day party I got a standing ovation from an admiring crowd stating it was the best chocolate cake ever. Then laughed when they heard I snuck vegetables in a dessert. Our neighborhood is full of rabbits (lack of foxes and presence of coyotes). 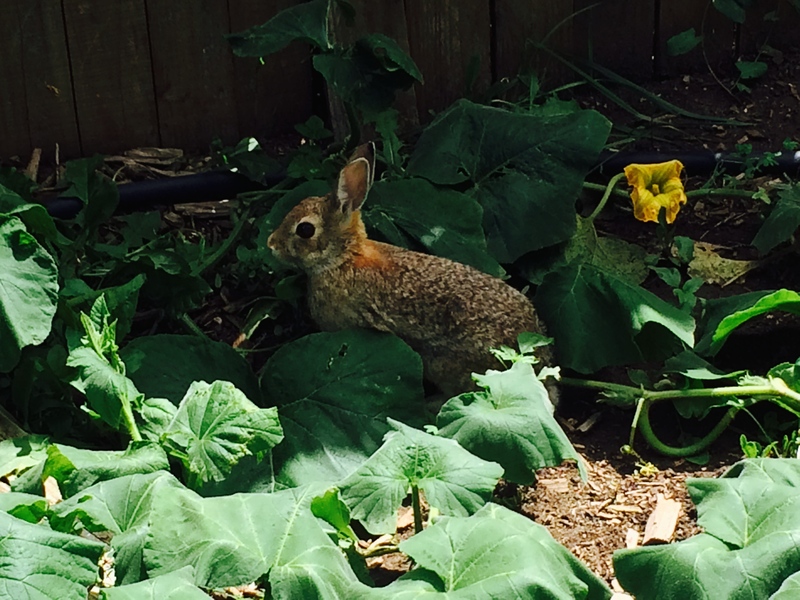 One and maybe two bunnies made it into our garden although interestingly they haven’t eaten anything that I can see. We grew cilantro this year, it was gorgeous so I tried my hand at some Indian Chutney. 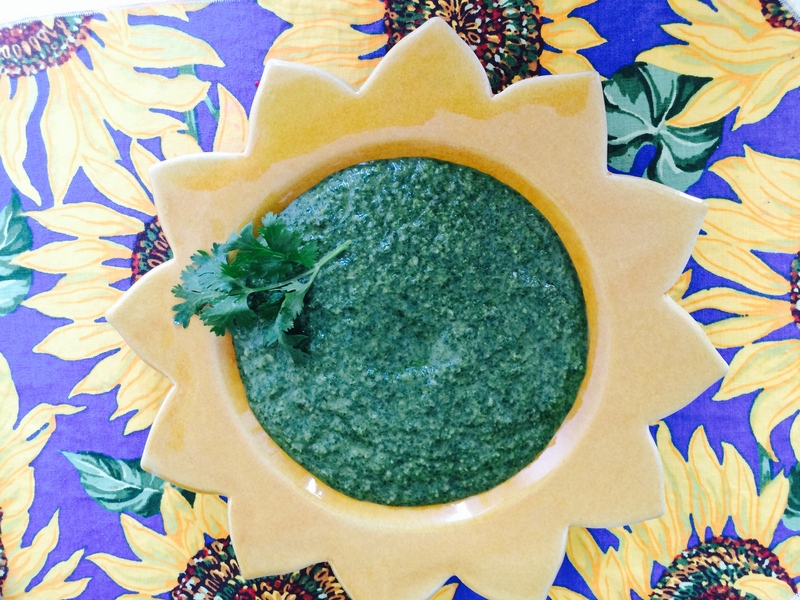 This Cilantro Chutney recipe is from The Splendid Table (my favorite website). I fell in love. I put it on roasted chicken and fried eggs. 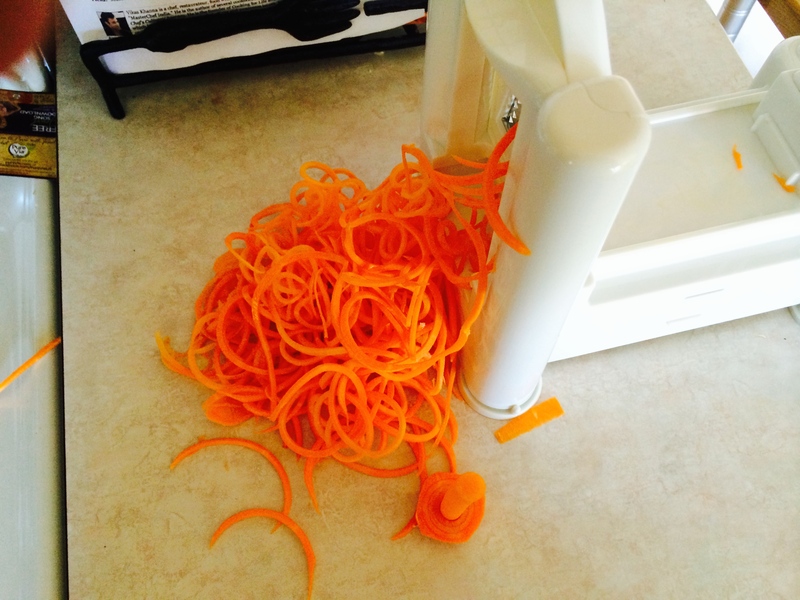 I joined the spiralizer craze, getting one for my birthday. 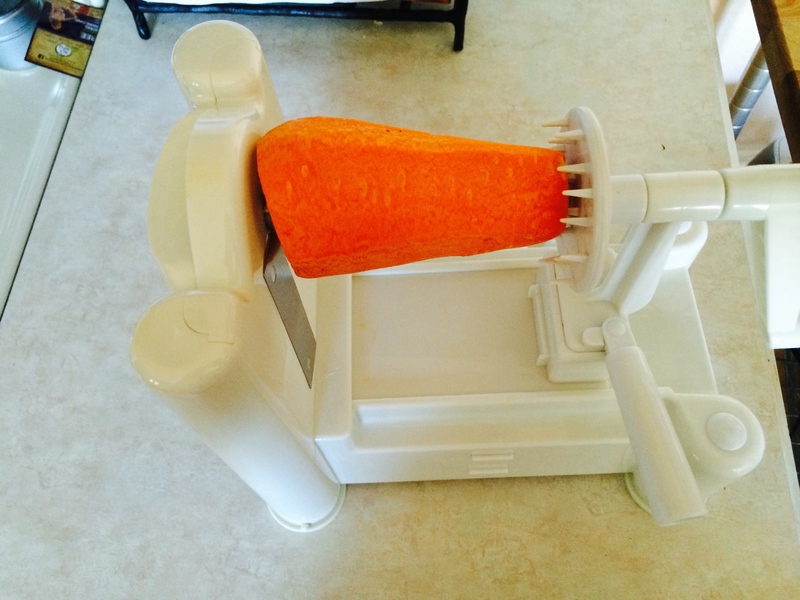 I spiralized carrots, zucchini, potatoes and yams. I loved placing the carrots and the zucchini in a microwave safe bowl, steaming it for about a minute and tossing basil pesto in it. Yummy! 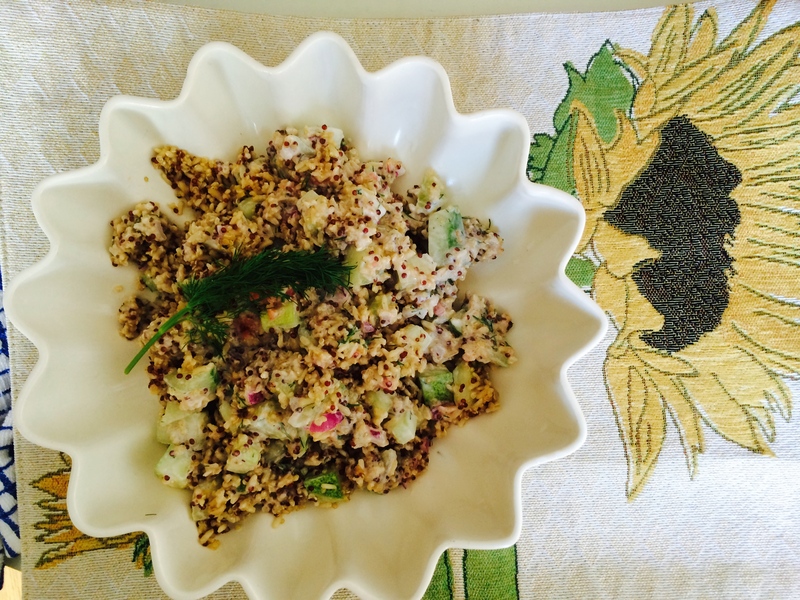 It could also be adapted into a cold salad and tossed with a vinaigrette or dressing. This next recipe was from Bon Appétit magazine Watermelon Gazpacho. 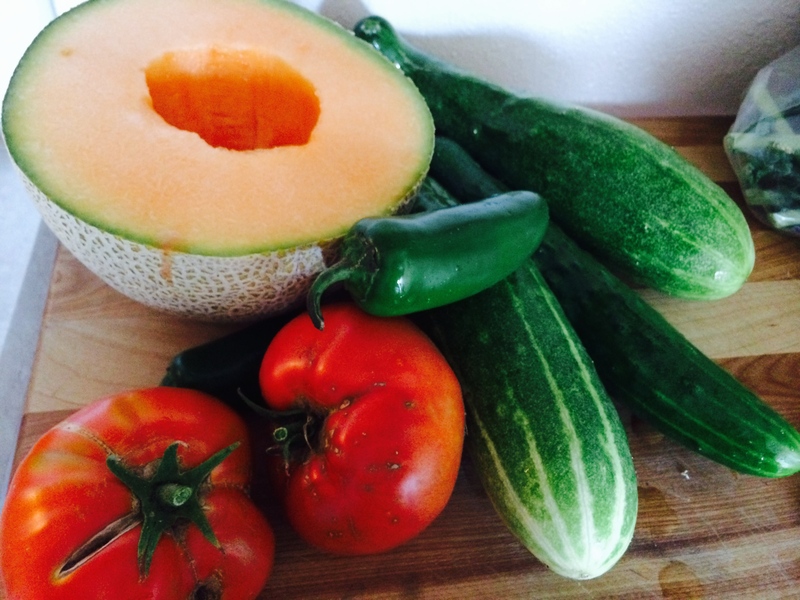 Cantaloupe was abundant and inexpensive at the grocery store, so I adapted the recipe. 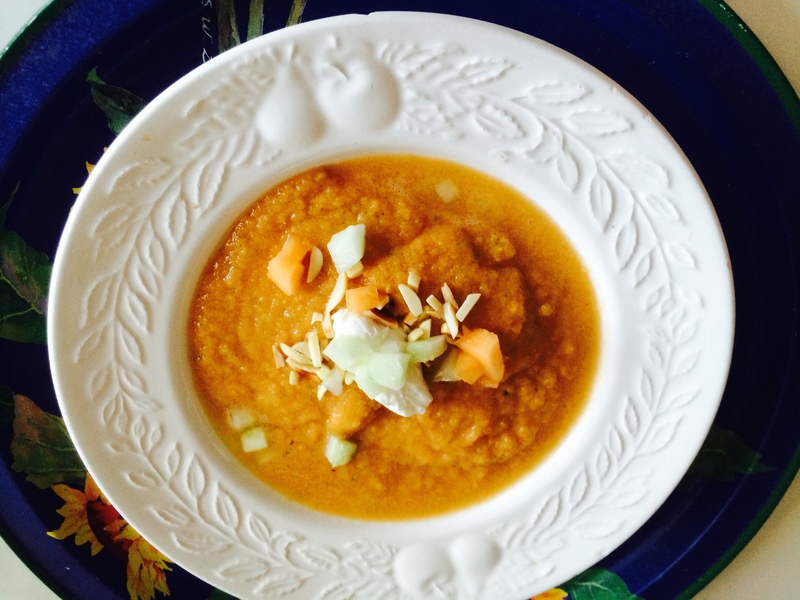 Patty’s Cantaloupe Gazpacho. Oh it was so good. Sweet and cool eaten as an appetizer on the back porch. 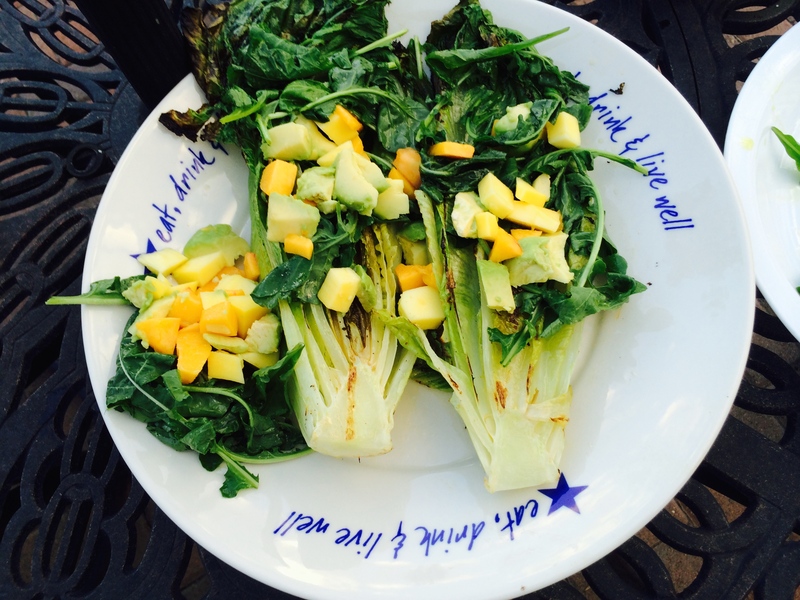 This recipe was also from Bon Appétit magazine for a Grilled Salad. I adapted this as well. The romaine lettuce was 99 cents per head. I brushed it with olive oil and my husband grilled each side for about 1-2 minutes. Oh this was wonderful! 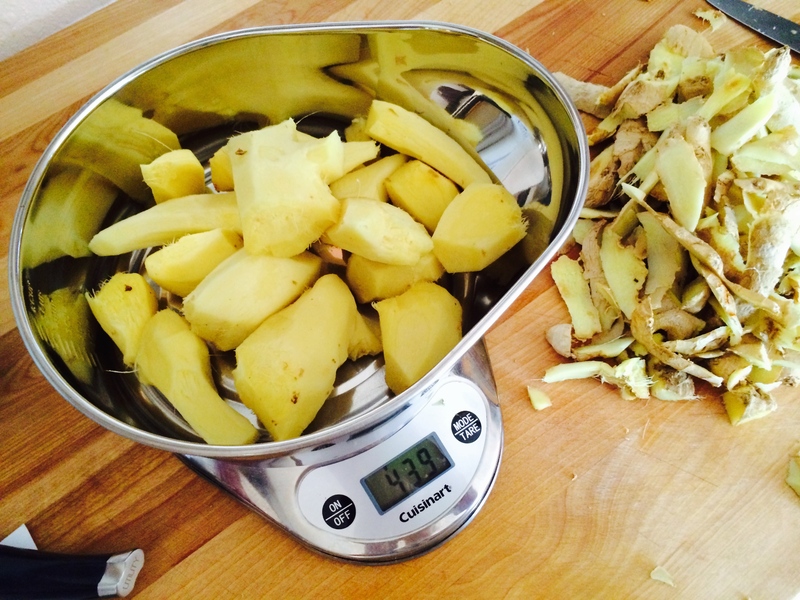 I adapted this recipe to what produce was available. And finally, Ginger Marmalade. 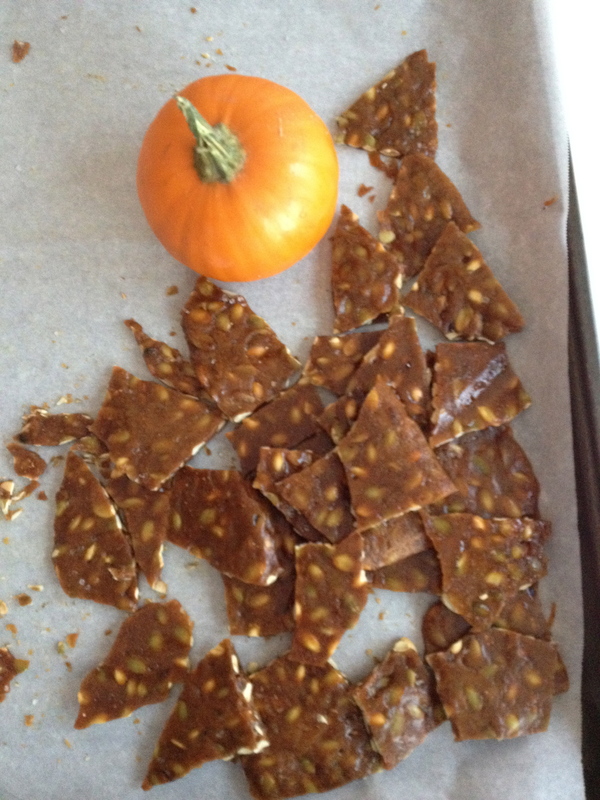 I was excited to make this recipe since sampling James Keillor and Sons Ginger Marmalade. 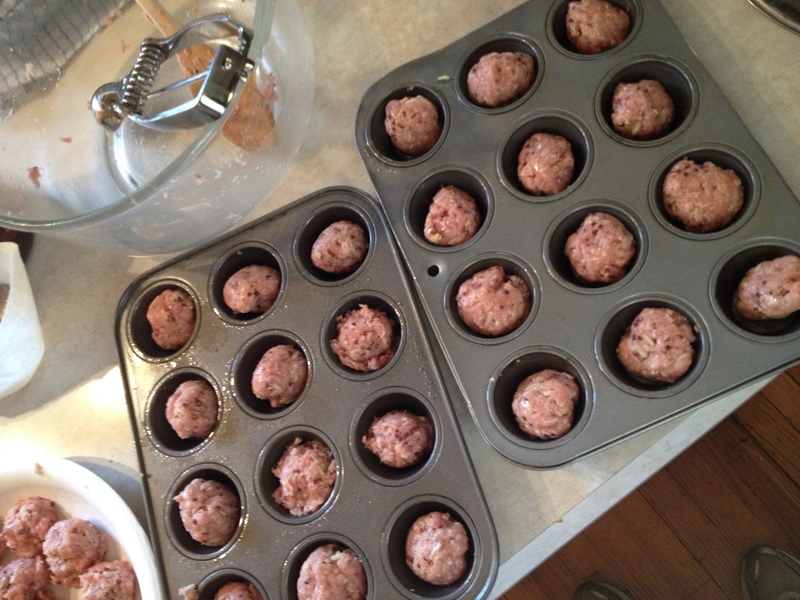 I surveyed many recipes on-line, it was a daunting task. Ginger can be a bit HOT. This marmalade was HOT. 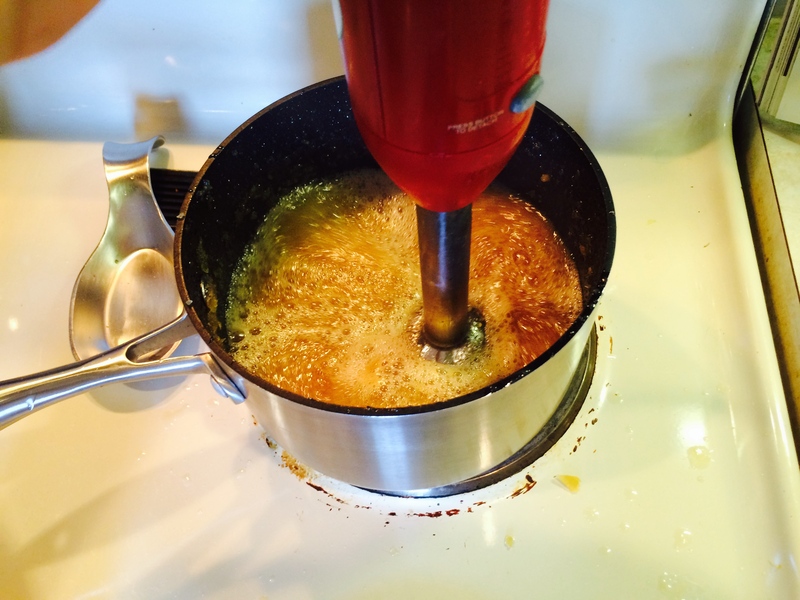 The ultimate experimenter, I looked at other recipes and found an Orange-Ginger Marmalade. 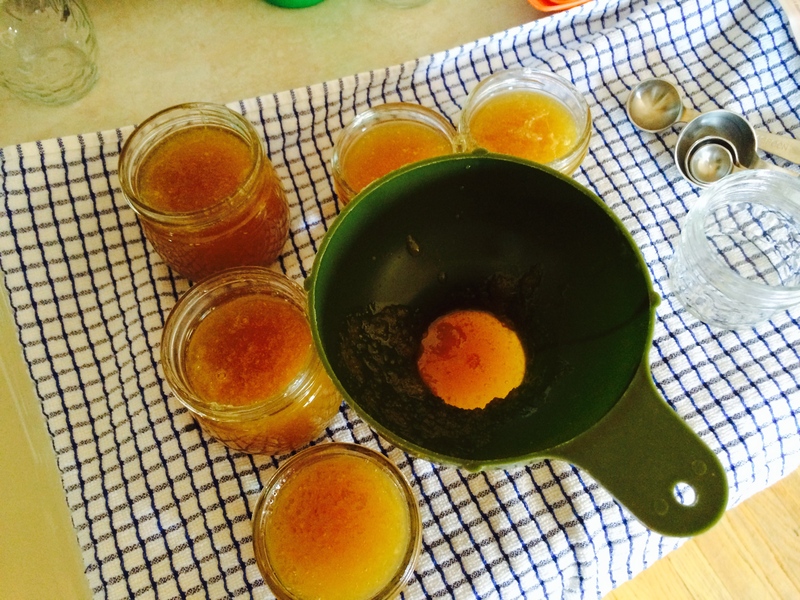 So I mixed my marmalade with regular store-bought orange marmalade and tamed it down a bit. 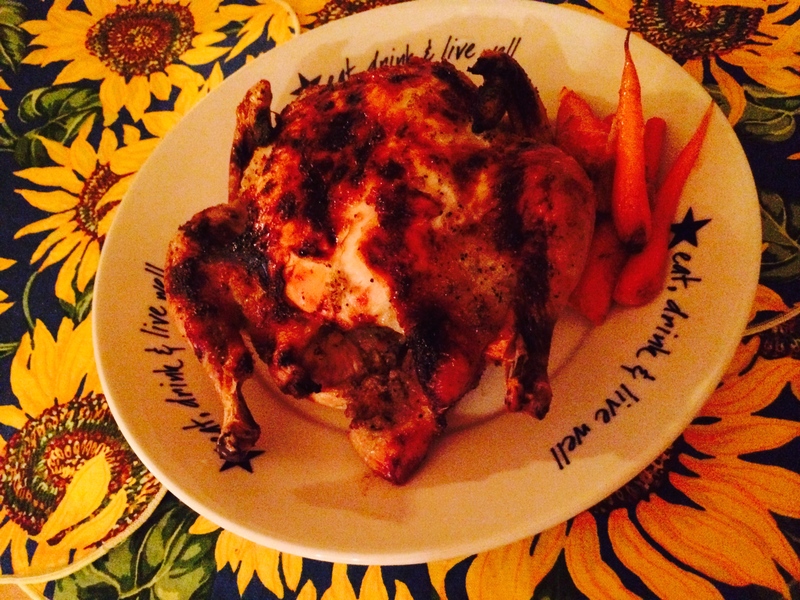 I also used it as a glaze for roasted chicken and roasted carrots from the garden. I went to Portland in August with nursing colleagues Nancy, Rita and Kathy, for a conference. 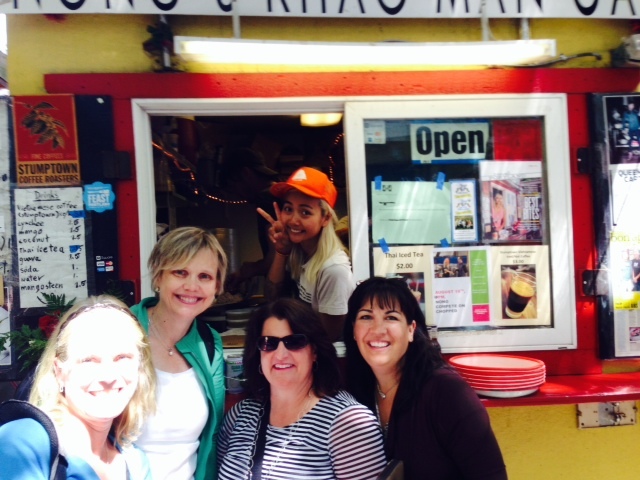 A manager for a local retailer tipped us off on to Nong’s Khao Man Gai food truck for lunch. Nong was the named Food Network Chopped Champion just 4 days before we visited. What a sweet girl who has her own bottled sauce and make the best chicken and rice. It was a summer of reflection for me. 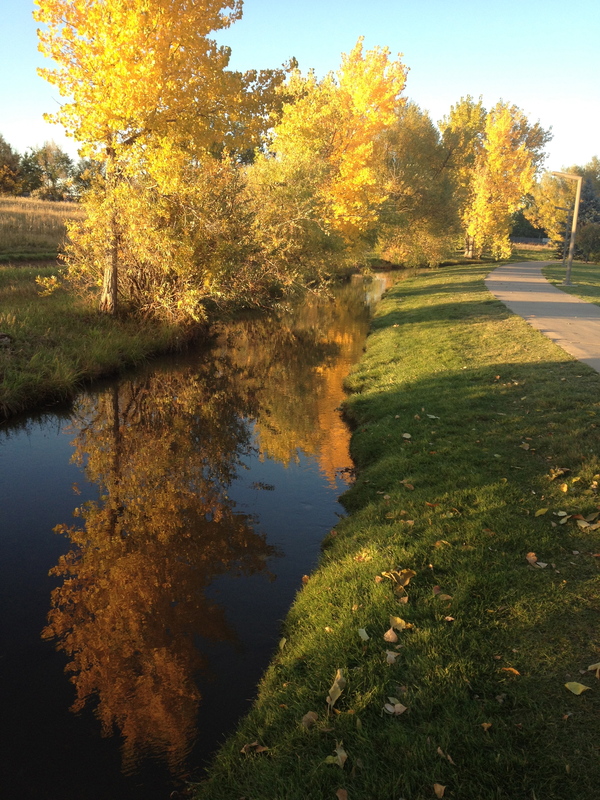 Autumn will bring some changes. Ready for new challenges. 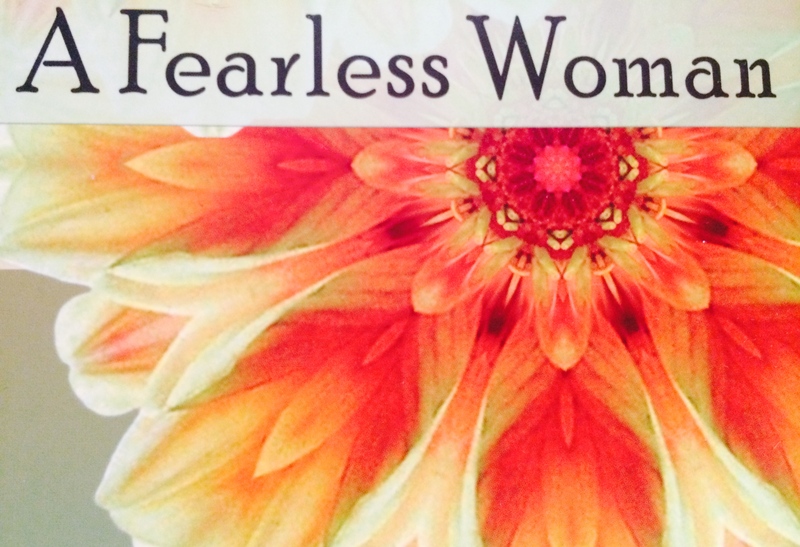 The Fearless Cooking Club and friends gathered to celebrate all things tea. 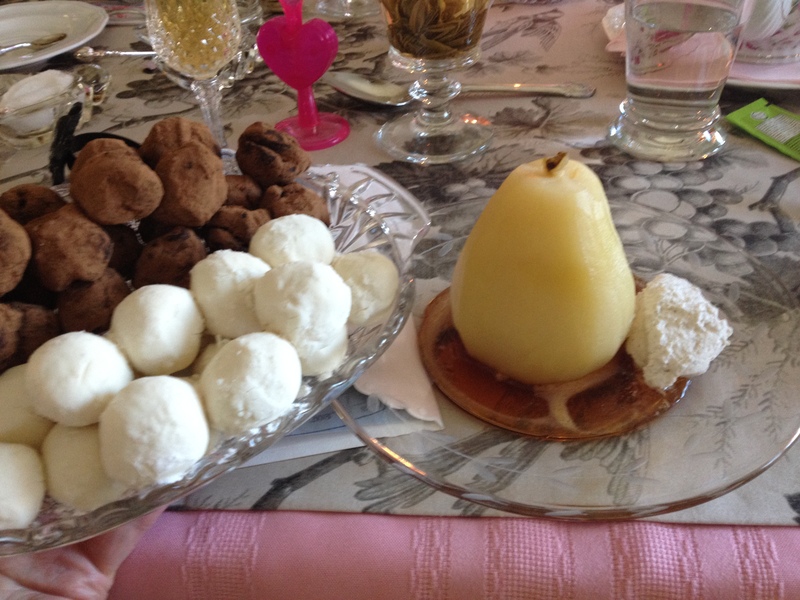 We had food steeped from tea in eggs, candy, fruits, vegetables, and salmon. We also drank tea as well. 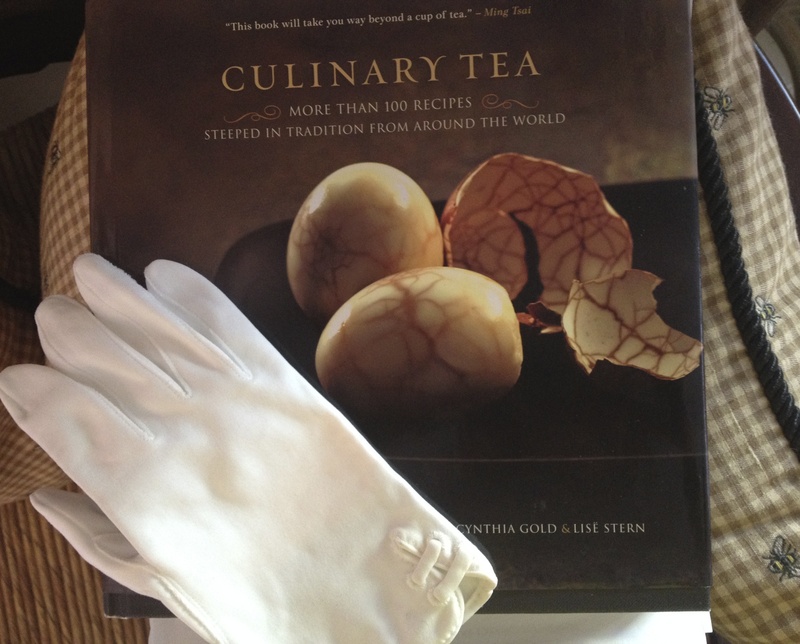 Culinary Tea written by Cynthia Gold, the tea sommelier at the Boston Park Plaza Hotel and Towers, was the basis of most of the recipes. Char visited Boston last fall and enjoyed an afternoon tea a the hotel. 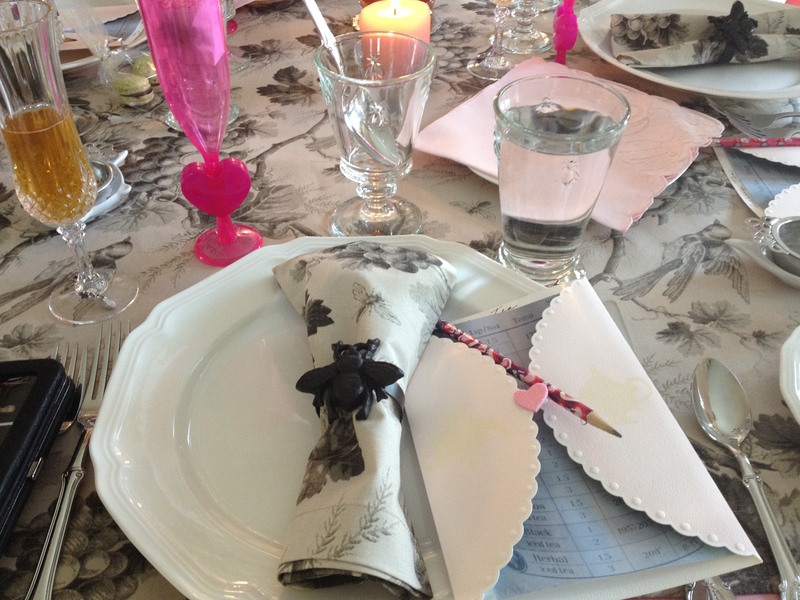 She delighted us with her cooking skills and beautiful setting to enjoy a culinary tea. 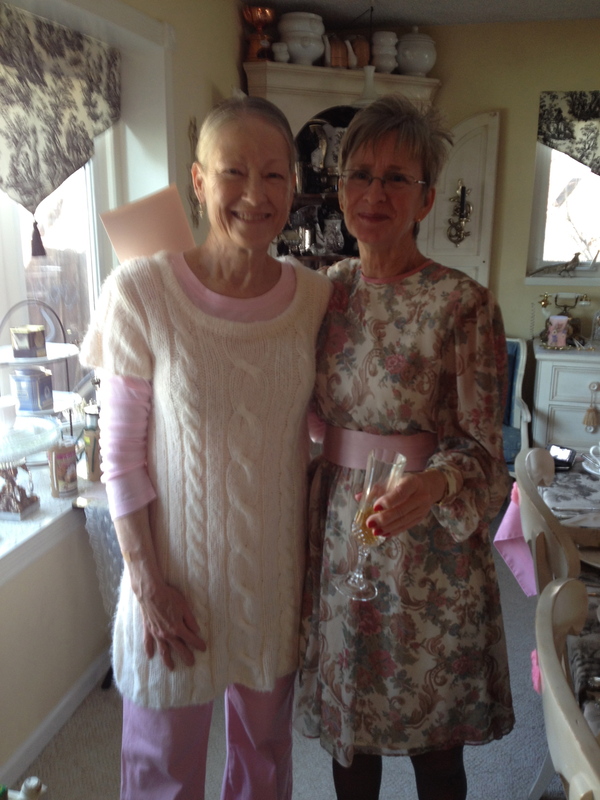 Char and Debbie greeted us at the door with a flute of champagne infused with raspberry truffle tea syrup. Wow! 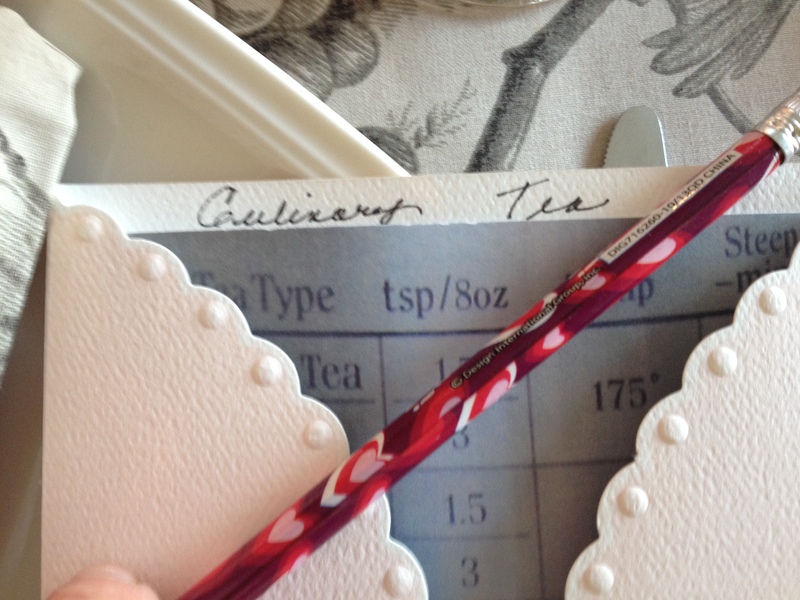 Each guest was presented with a card to keep track of types of teas tasted. 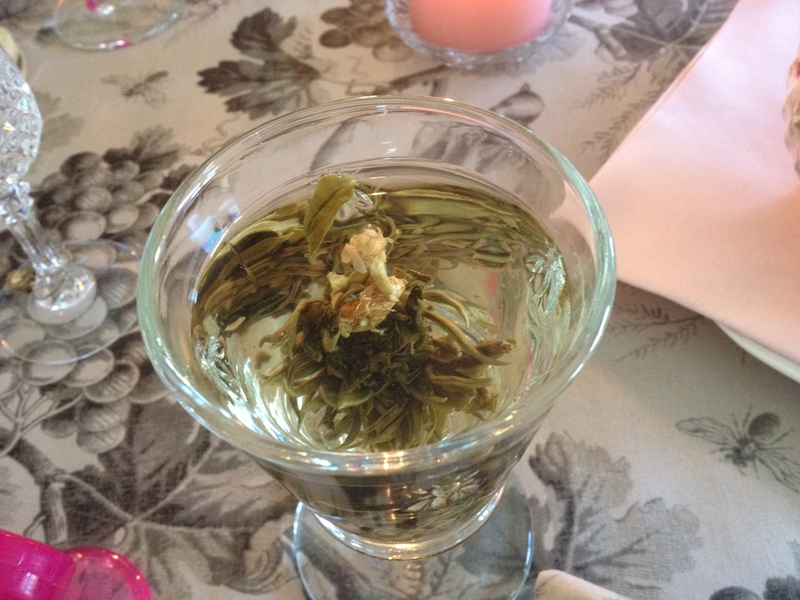 We started with a flowering tea pod or bud. Our first course was marbled eggs. They were hard boiled eggs, the shells cracked but left intact then steeped in green tea with brown sugar. 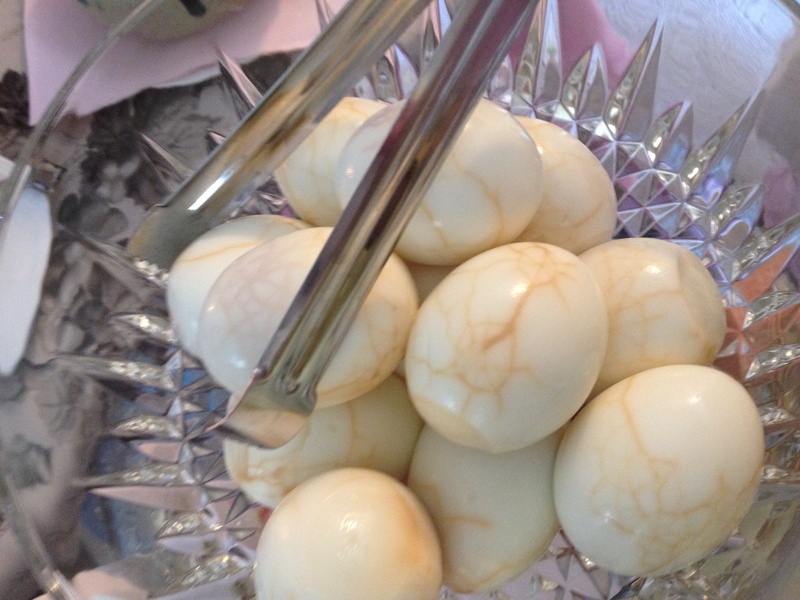 After two days of steeping in the refrigerator, the shells were removed and voila marbled eggs. 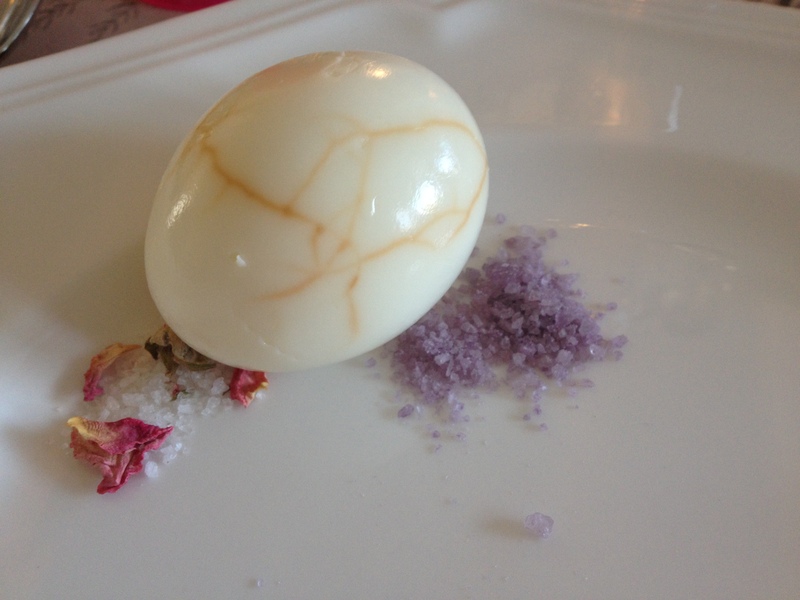 The marbled egg was served with rose petal and wine salts and mixed green salad. 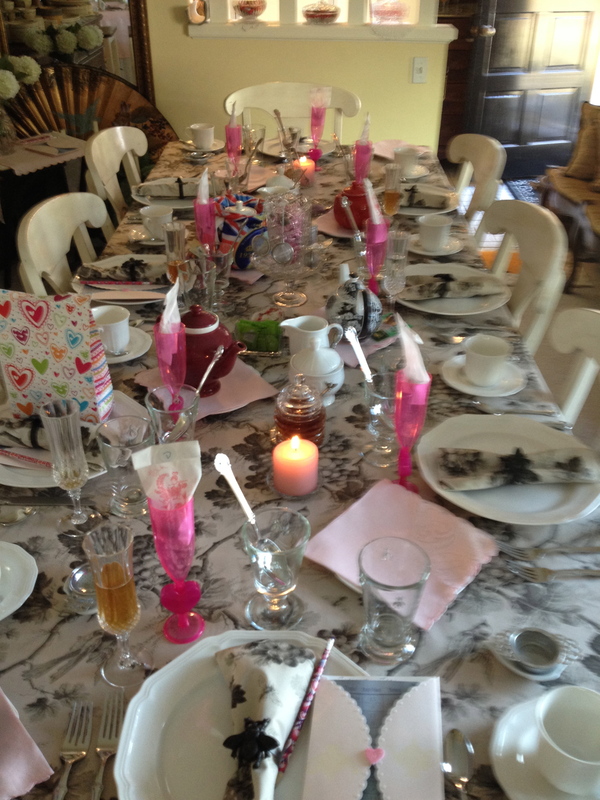 Each guest brought a tea pot. 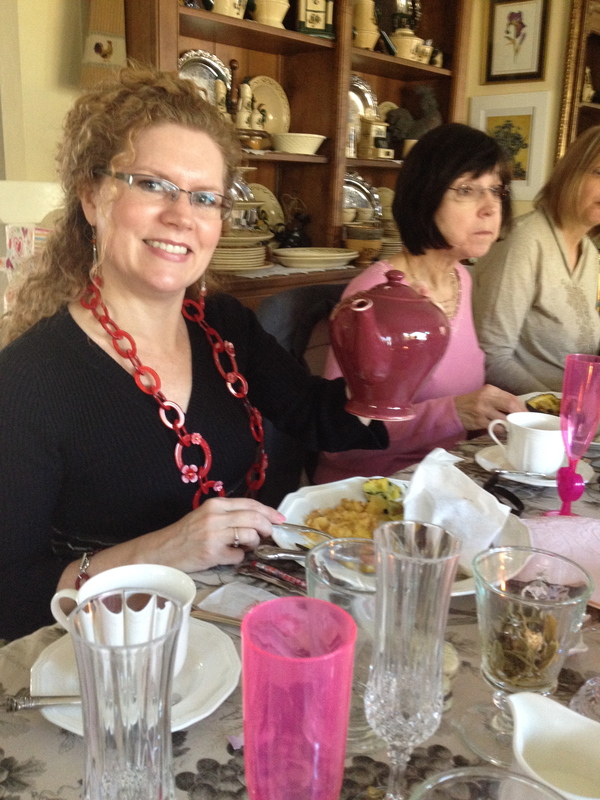 We all went around the room telling the story of our teapot and the type of tea we were sampling. This was an opportunity to share our teas with others. 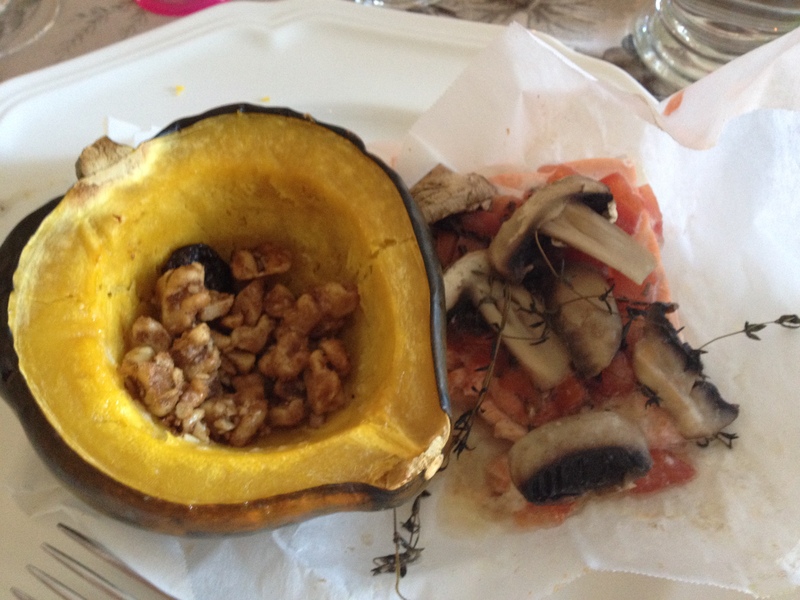 The main course was salmon en papillote steeped with darjeeling tea and acorn squash with chai cherry walnut tea. 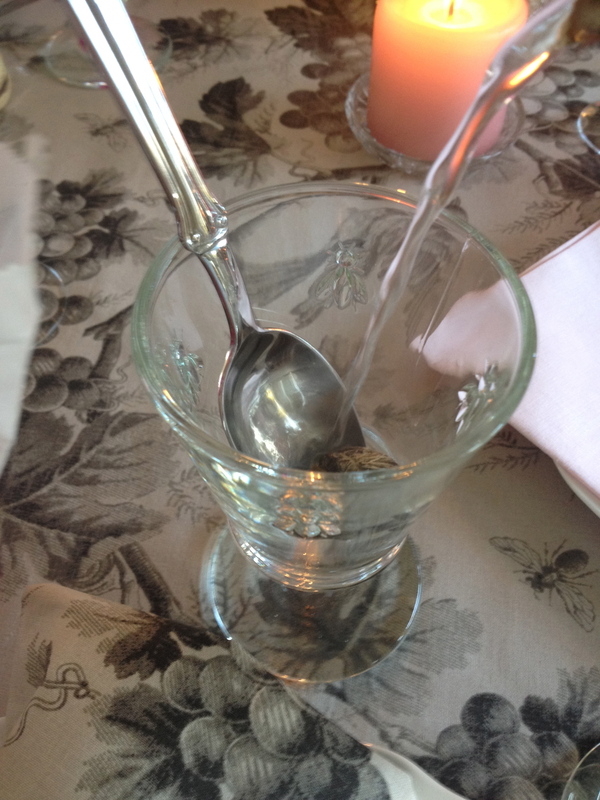 To cleanse our palate before dessert we had a Blackberry tea sorbet. I was surprised it wasn’t made with a blackberry tea. 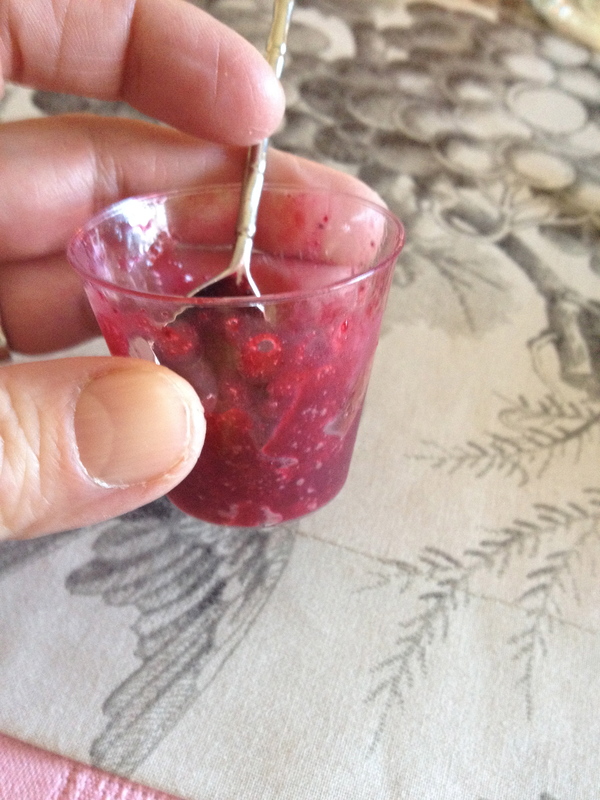 Instead fresh blackberries, sugar and Darjeeling or Assam tea. 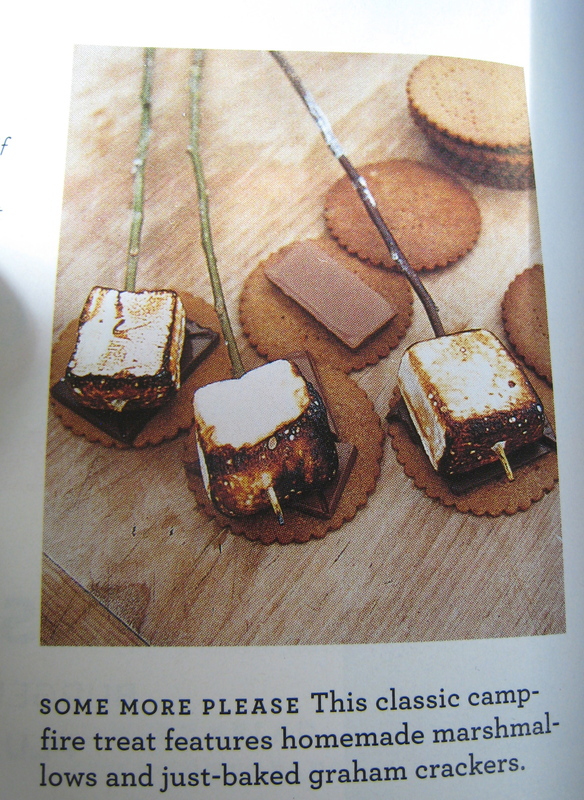 1) Everything was sumptuous and beautiful. Char hit a high mark with her beautiful presentation and culinary tea skills. Her dining room was a beautiful tea room. 2) Char said that if she could change one thing she would’ve put more cracks in the egg shells before steeping them in the tea for 48 hours to add more marbling. I thought they were wonderful. The salts made of rose petals and wine were Mary Beth’s contribution from her trip to Europe this past fall. Thanks Mary Beth, they were a spectacular addition. 2) Everyone had a touching story to tell about their tea pots, given to them by loved ones or special memories of purchasing it. I didn’t have a remarkable story to tell about my tea pot, I had just purchased a new one the day before as I had broken mine. 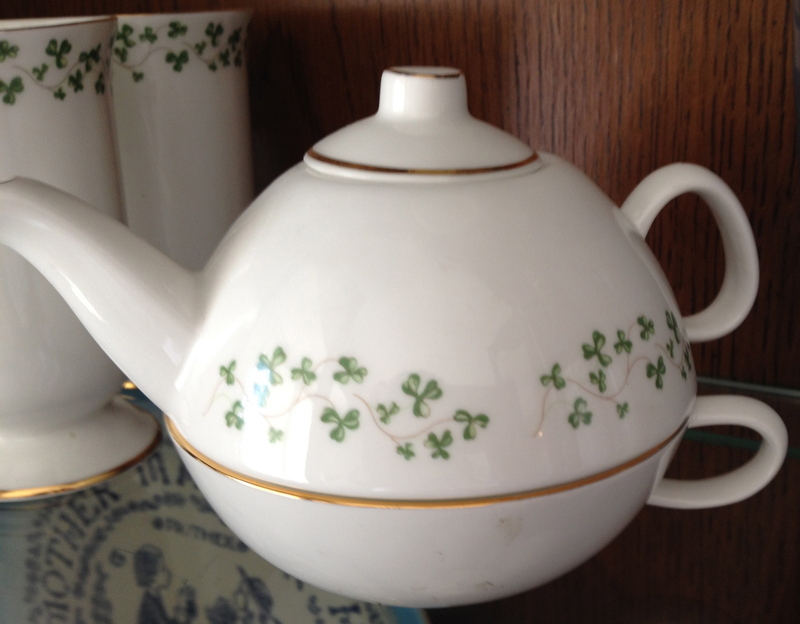 Pictured below is a combination tea pot and cup that belonged to my mother. She purchased it in Ireland (I believe), made in Galway. My father is caring for it at present. I carefully dusted the glass shelving it sits on along with twelve Irish coffee cups. I hope to collect it someday. Thank you Char for a wonderful afternoon of all things tea! 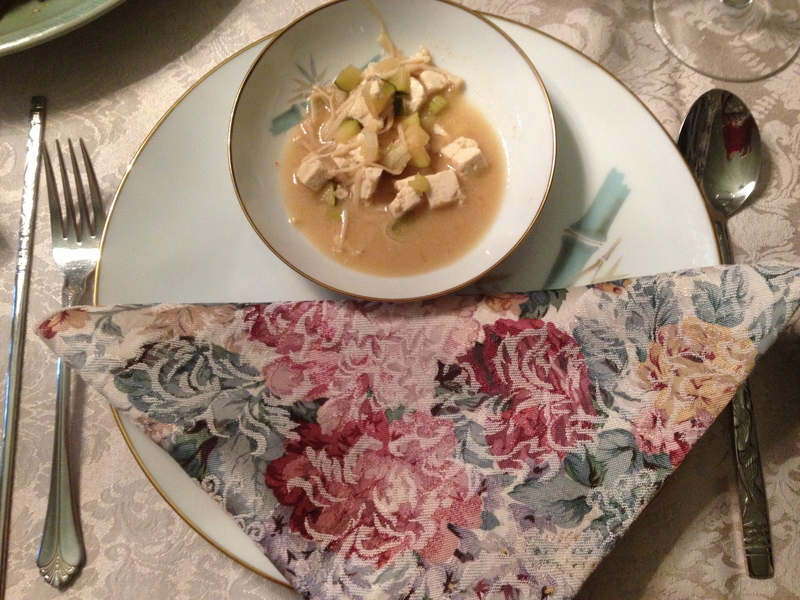 The cooking club members gathered at Julie’s house this past week to relax and enjoy the beautiful fall we have had this year. We had a fall assortment of dishes; tomato bisque, mini pepper appetizers, apples with salted pumpkin caramel sauce, fresh grapes, pumpkin bread, and sweet potato pie. We also got an lesson on how Applejack liqueur is made from fermented apples that freeze in the winter. 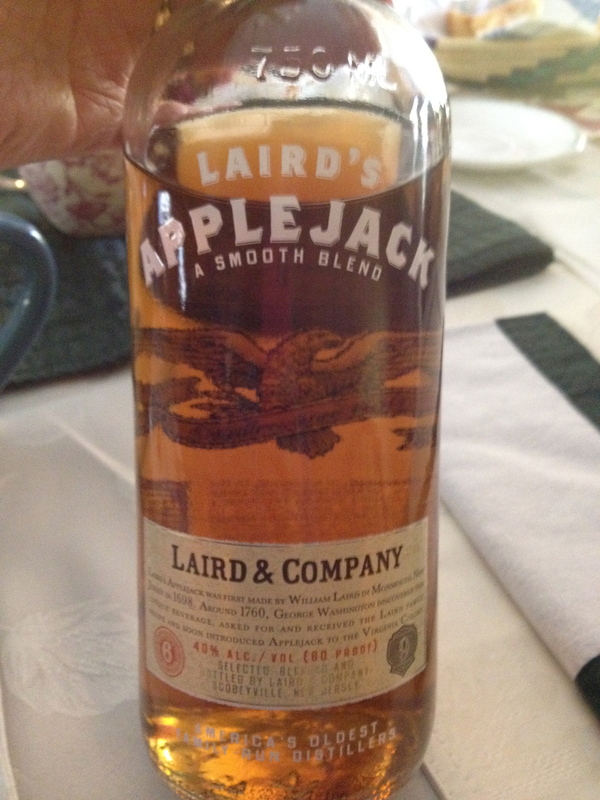 I mixed my 1/2 shot of Laird’s Applejack with warm apple cider. My legs got a little warm and numb with that 80 proof concoction. 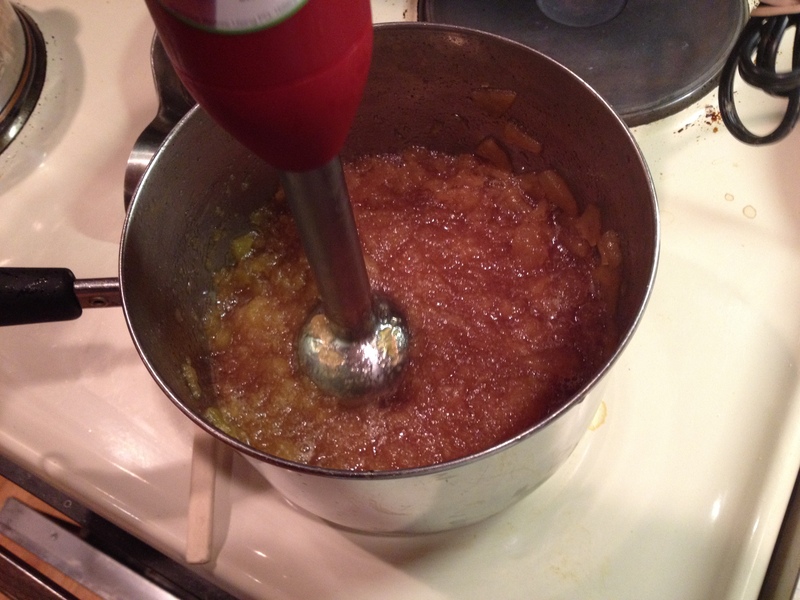 Afterward, we commenced to making Julie’s family apple butter recipe. 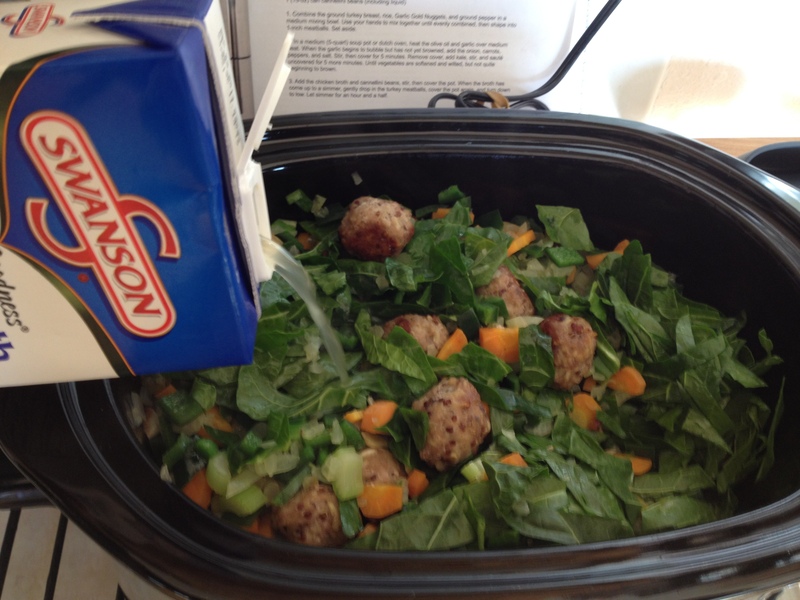 She cut the original recipe down for an easy undertaking. Julie likes using Pink Lady apples. 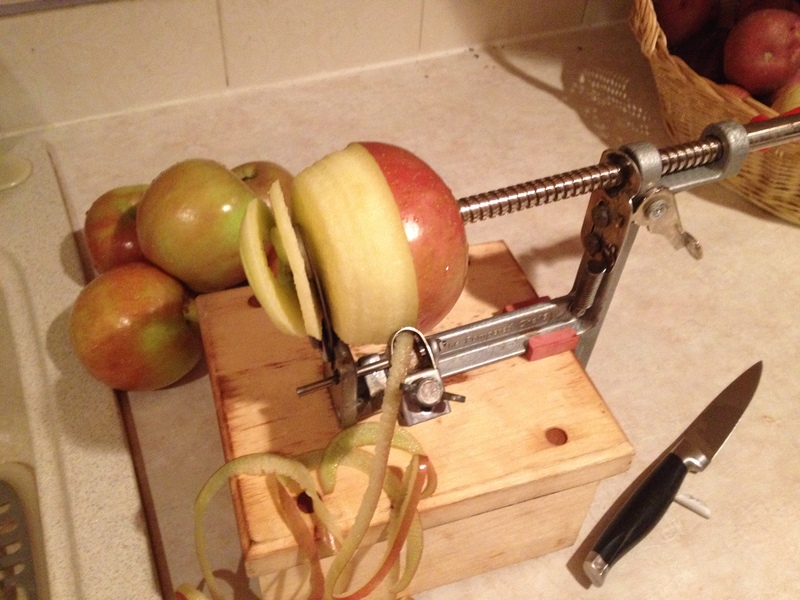 Peel, core, and dice 6 medium to large sized apples to make 6 cups. 1. Since the cooking process is 1 1/2 hours, we had to leave Julie’s house before seeing the final product. I made a batch at home tonight. It was easy to let it cook on the stove while I did other chores around the house. 3. 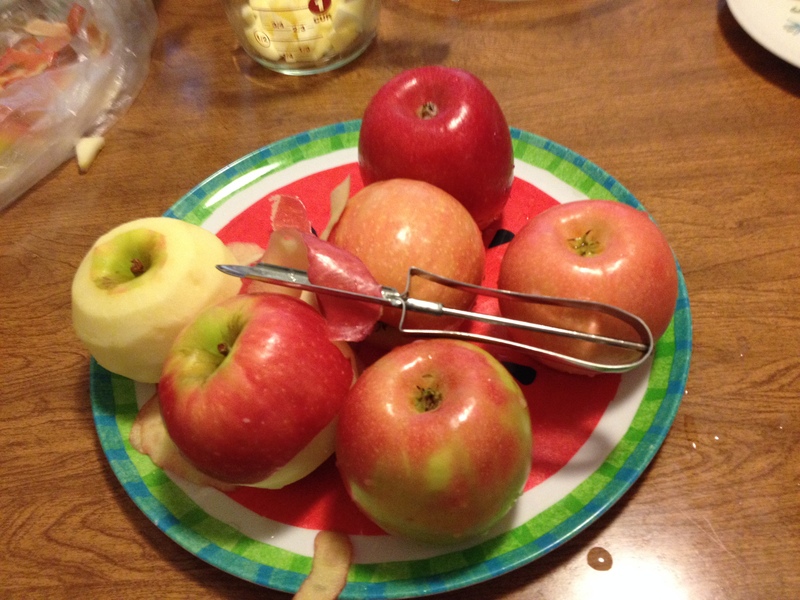 I used my apple corer-slicer-peeler and the process went very quickly in prepping the apples. 4. 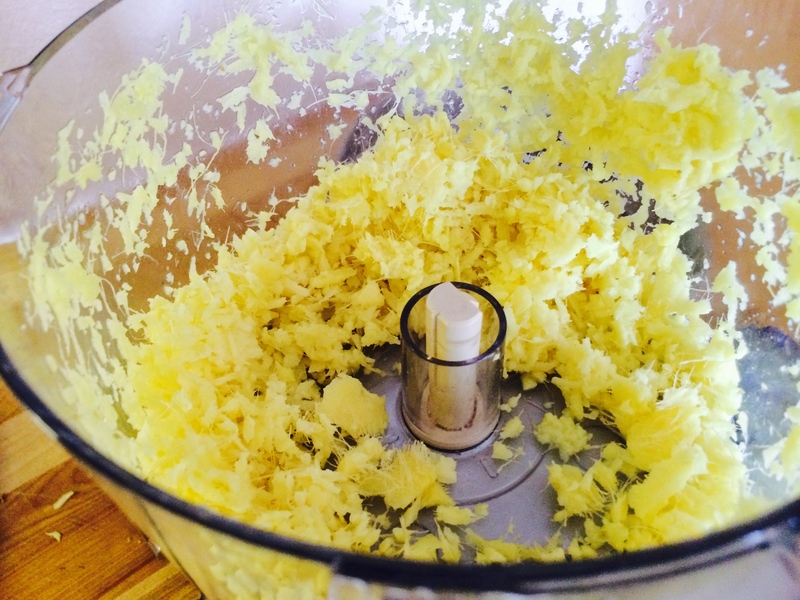 I used my hand emulsion blender when the apples had cooked through to mash the apples into butter. 5. 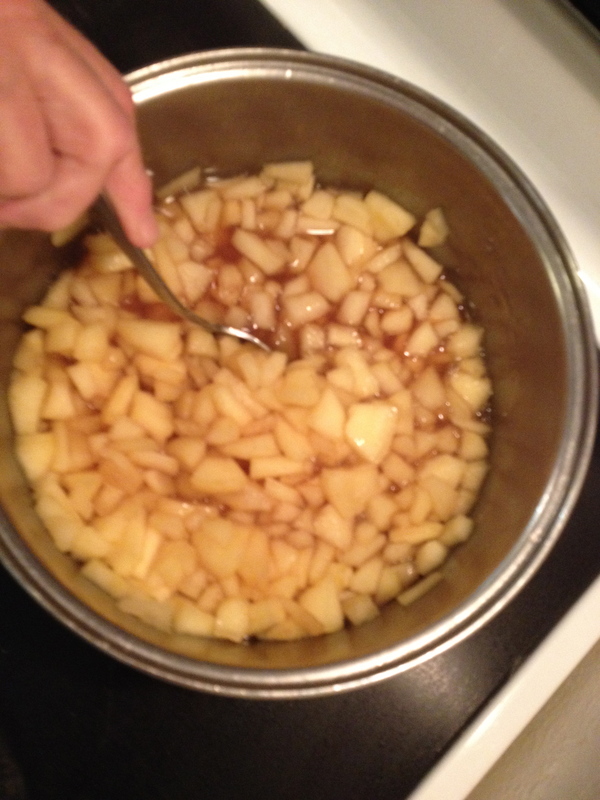 It is a very sweet butter with the sugar and the apple cider combination. You could easily decrease the sugar to one cup or less to your taste. 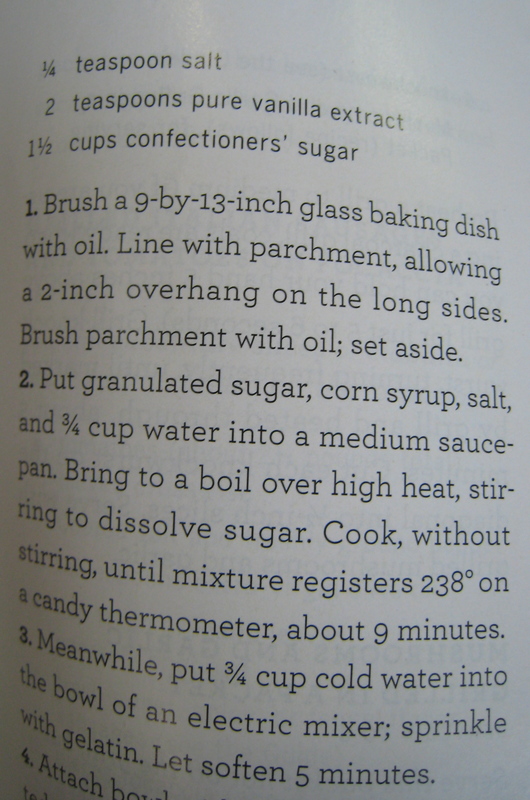 I also substituted the spices listed in the recipe with 1 tsp of apple pie spice. 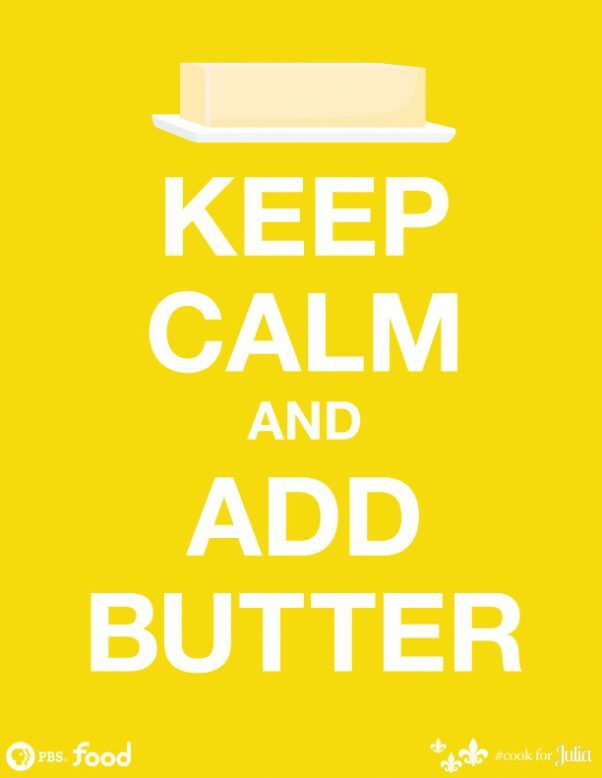 What a yummy, smooth and sweet butter. It was yummy to top on buttered, whole wheat bread. 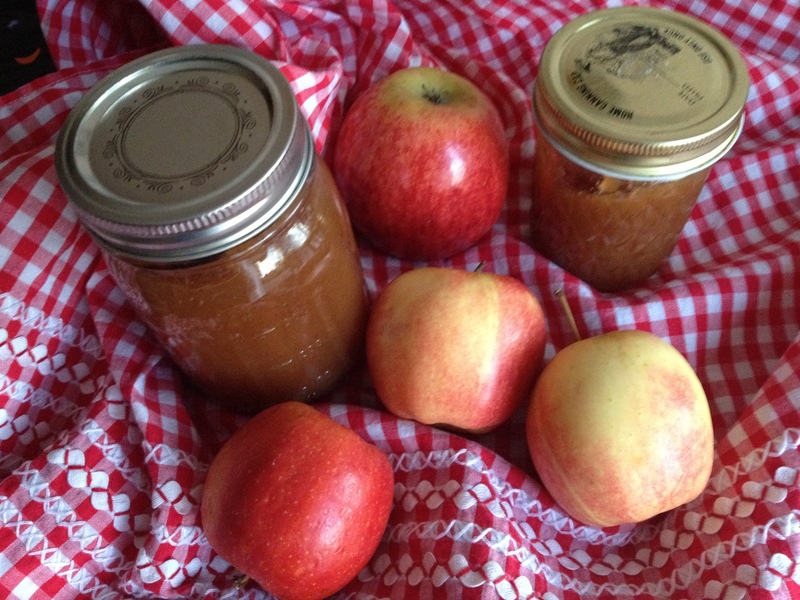 I had never made apple butter before this week. 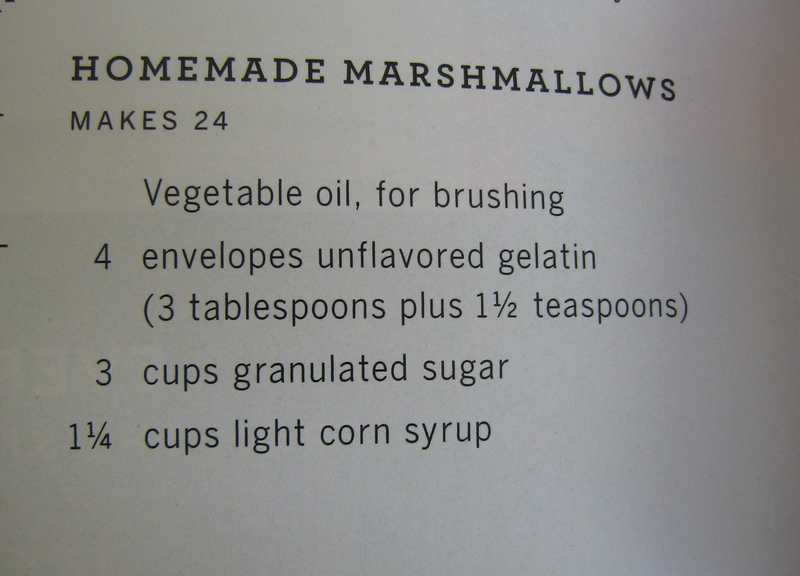 I felt my midwestern roots when making this classic recipe. A flashback to childhood. The Korean Dinner Party was a two-part adventure. 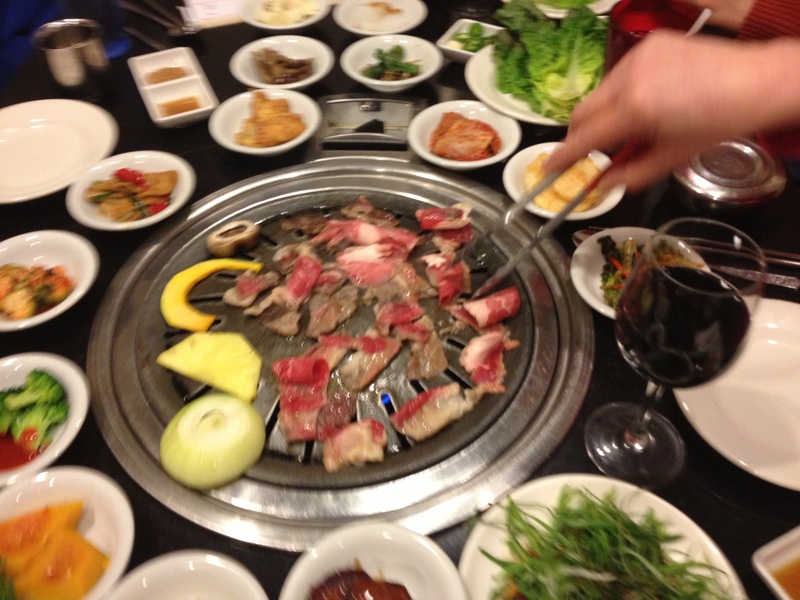 The first party was held at Seoul Barbeque in April. 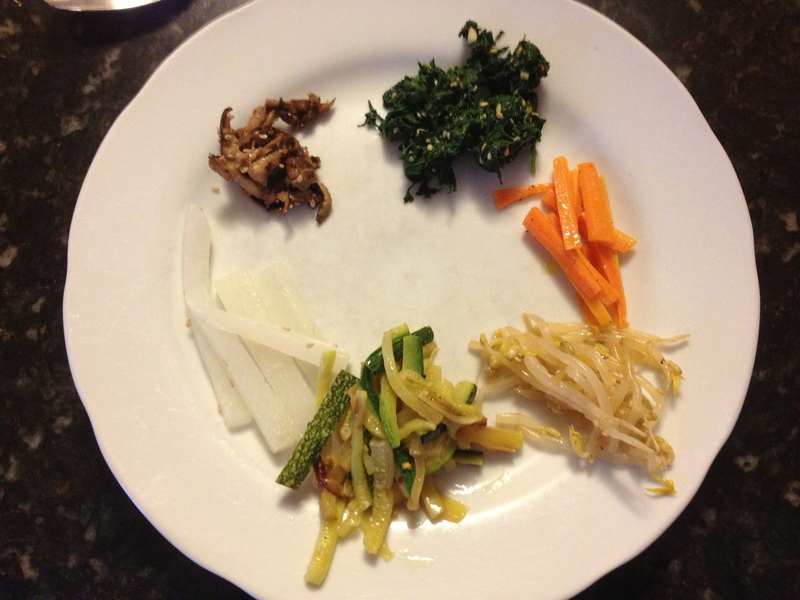 The thought of making the food for an actual Korean party was a little overwhelming. 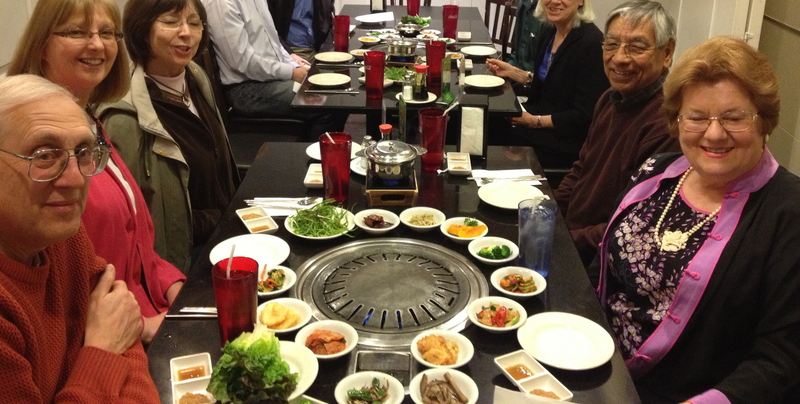 We thought we would partake in one of the best Korean restaurants in Denver first. Look at all the little side dishes that go with the sliced beef!!! While we munched on all the delicious food, I showed this article from Bon Appétit about hosting a Korean dinner party. After a short discussion we decided that we could put this party together! Barb volunteered to host. All adventures must start with shopping. 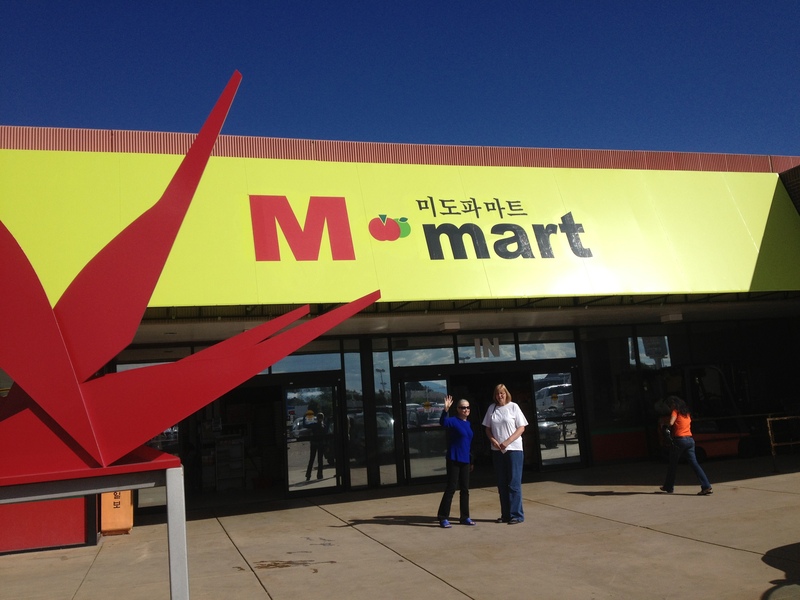 M Mart is a Korean/Japanese Grocery Store. We let Barb take the lead with shopping she had more experience. She and her husband adopted their son from Korea. Barb has visited Korea twice and raised her son by exposing him to his native land. 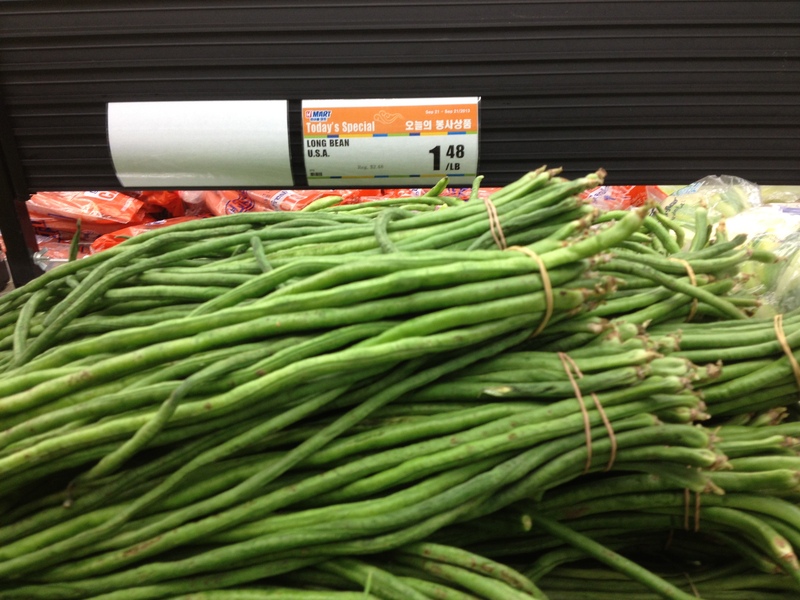 M Mart has a great choice of meat and authentic Korean ingredients. 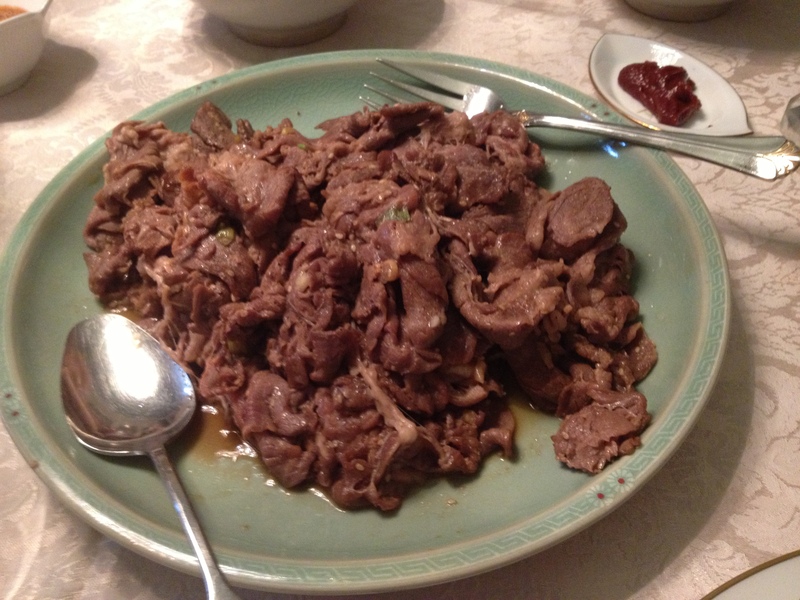 The meat for bulgolgi is thinly sliced rib eye steak on the cross grain. 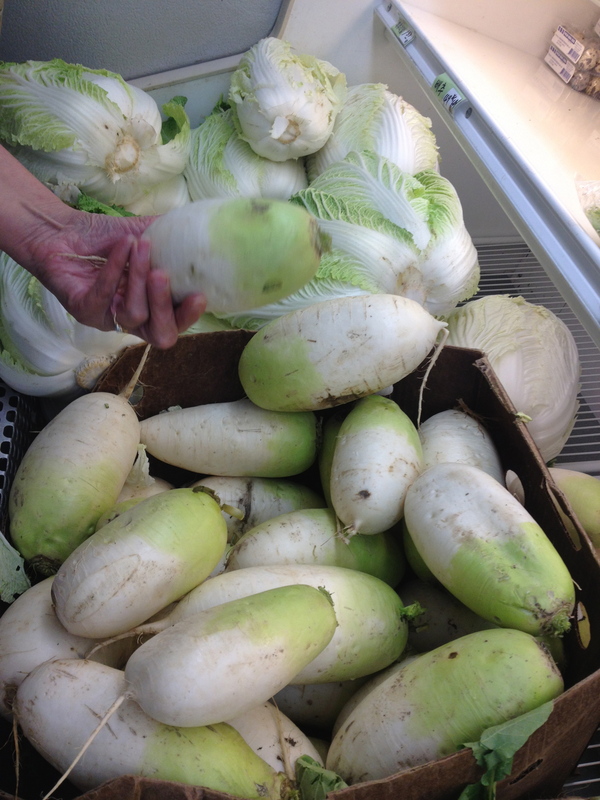 After filling our baskets we ventured over to the H Mart which is a large Asian grocery market. It was huge. 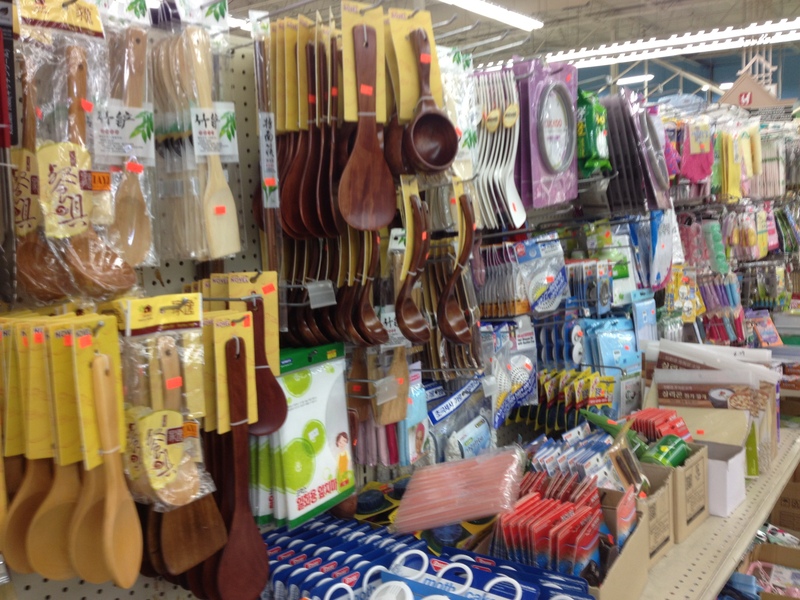 The produce and kitchen wares were overwhelming. What fun it was! Now, lets get down to cooking. First with the rice. 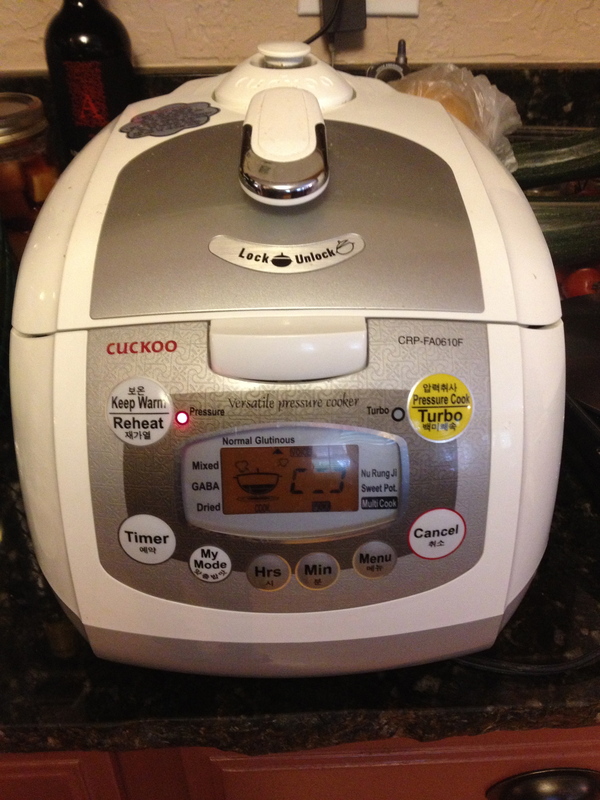 This is a Korean rice cooker – the Cuckoo. Three minutes before the rice was cooked, the top shot off steam. 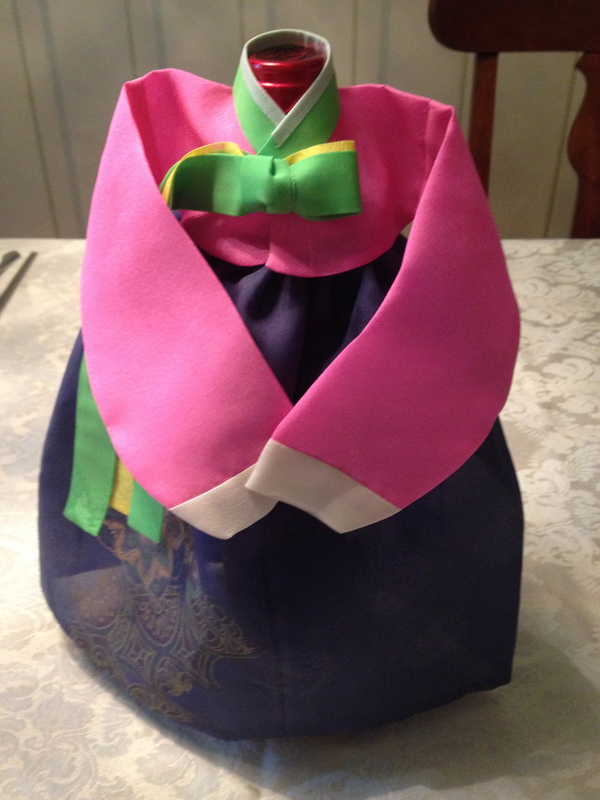 Then it spoke in Korean that the rice was done (I’m guessing) and it tweeted “Cuckoo!” So cute! 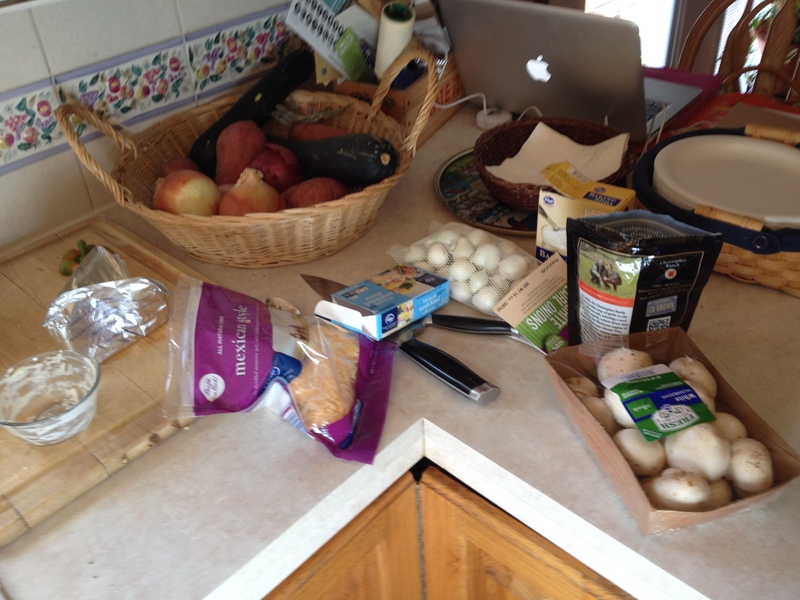 This is when it is good to have a lot of people in the kitchen… chopping and shredding and mixing ingredients. 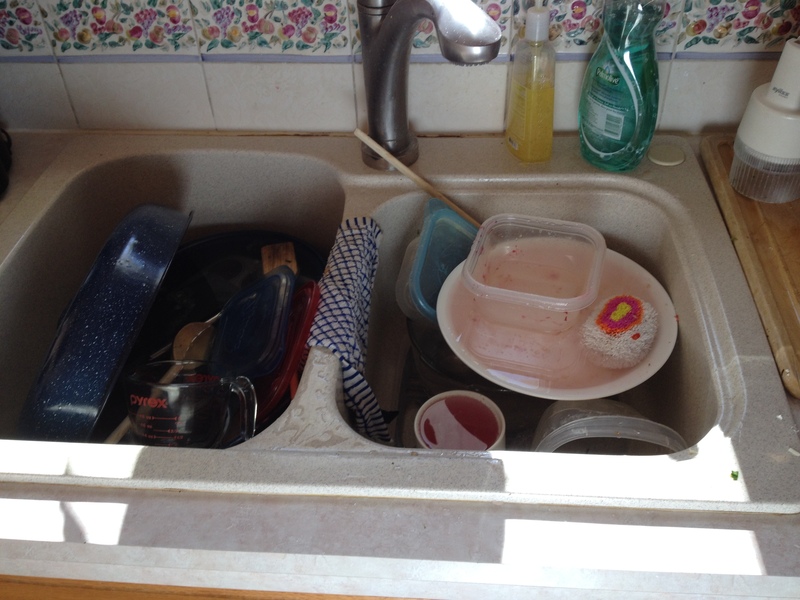 Rice starch water: rinse rice once with water and drain. Add a 1/2 cup of water again, toss and swirl around the rice for 30 seconds. You will see the water turning milk-like. Add 2 cups o water and swirl to collect all the starch from the rice. Drain to save the starch water in a bowl (it doesn’t say how much rice to start with – we used a couple of cups of dry). 1. Bring small 1 quart stone or heavy bottom pot over medium high heat. Toast the anchovies for 1 minute and pour the rice starch water into the pot. Add the sea kelp and bring to boil; simmer for 5 minutes. 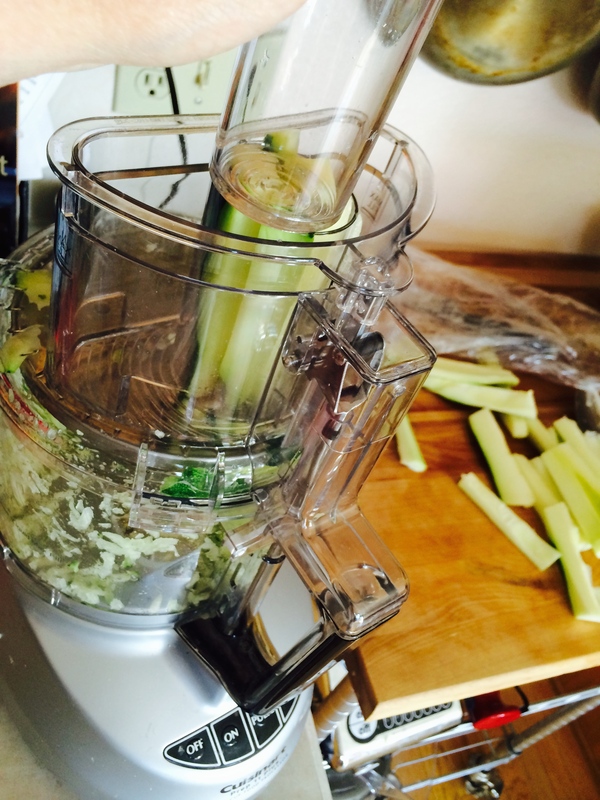 Remove the anchovies and sea kelp and discard them. 2. Using a course mesh strainer, mash the Doenjang paste into the pot so it incorporates into the stock. 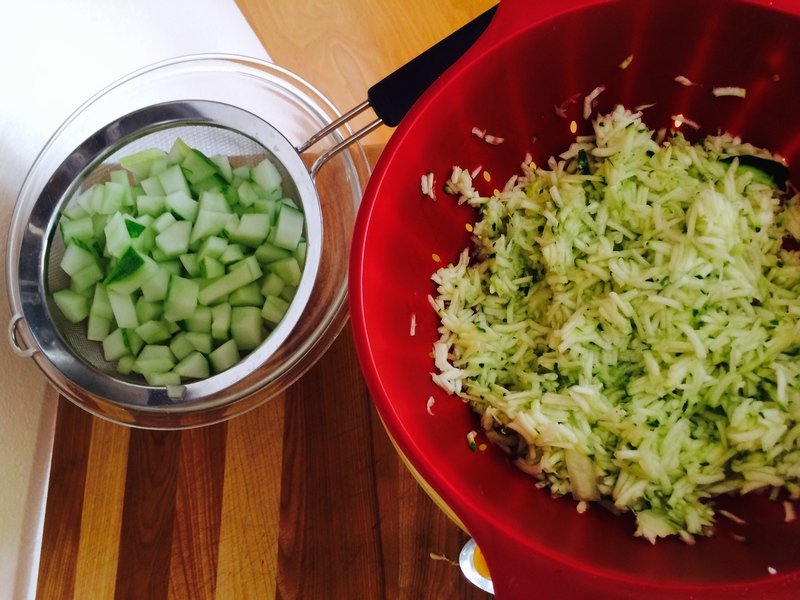 Add onion, zucchini, chili flakes and let them boil. 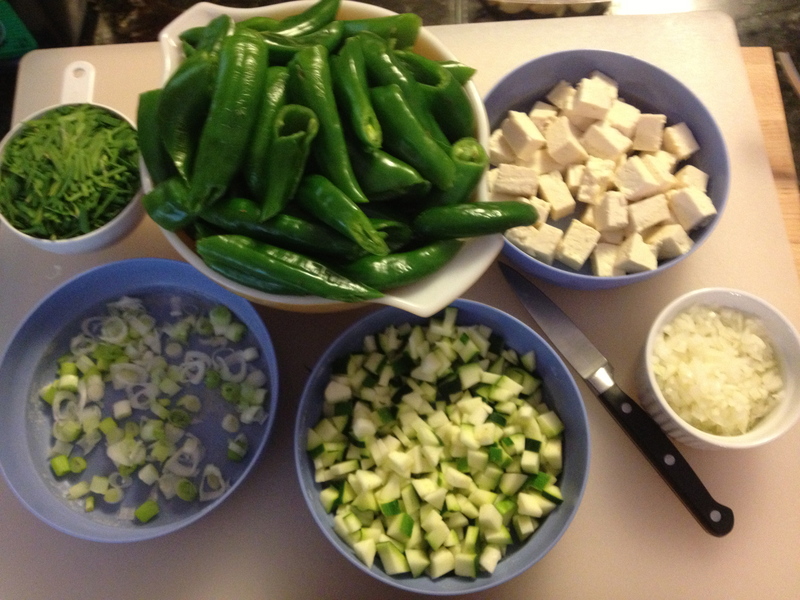 Add tofu, garlic, chili and cook for 2 minutes. 3. Lastly add enoki mushrooms and green onion. Remove the pot from heat and serve hot with rice. 1. The key to a good Bulgolgi is how the meat is cut. Barb said that she once purchased a ribeye at a local market and tried to get the butcher to cut it thinly on the cross grain. It didn’t turn out that well. 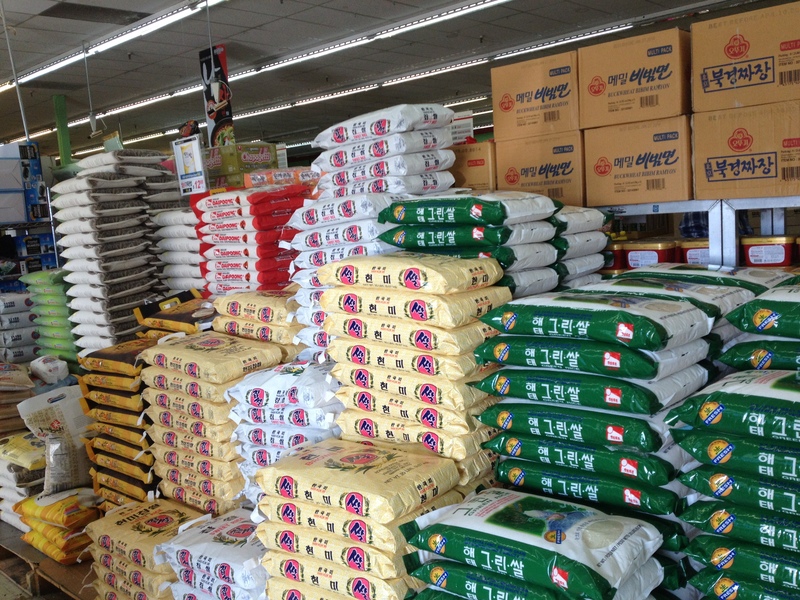 This is where an authentic Korean market shines. 2. 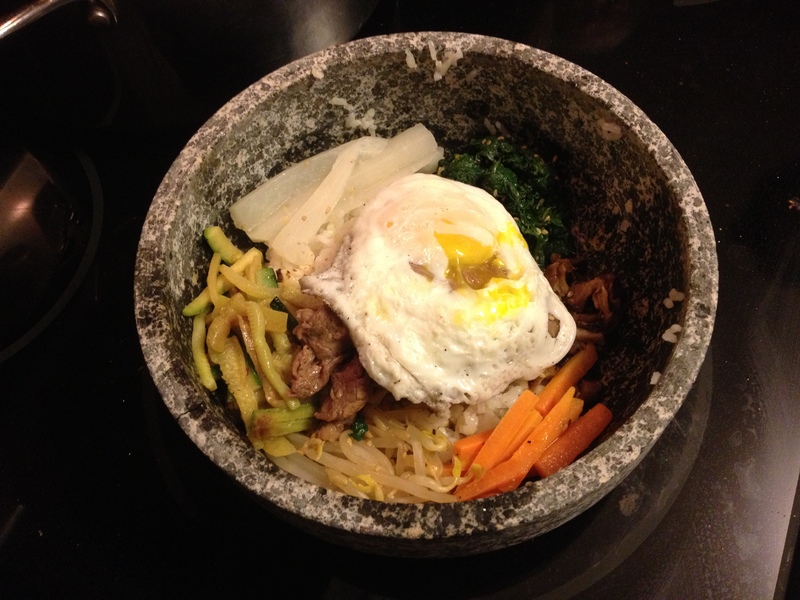 The bibimbap bowl is made of granite. It is heavy-duty so it can be heated on the stove top. It has a specific handle that looks like a clamp, to transfer it to a serving plate. The hot bowl crisps the cooked rice, then each ingredient is added and topped with a fried egg. Prior to eating, all the ingredients are cooked when mixed together. 3. The Doenjang Jjigae reminded me of Miso Soup (which is Japanese). The difference is that all the ingredients are Korean based. The fish broth was easier than I thought. The dried anchovies were cute. 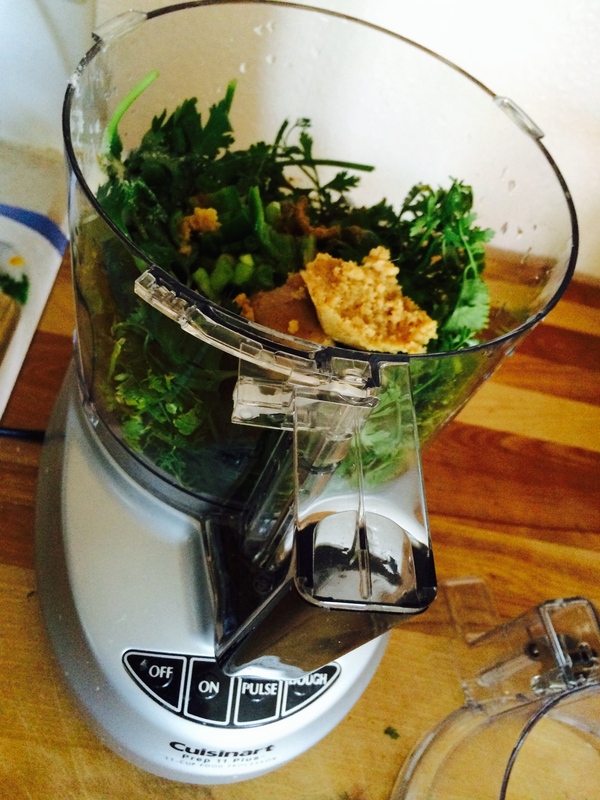 Anchovies and kelp were added to the rice water but removed/strained before combining the ingredients. 4. Barb said that everywhere they went in Korea, they were served watermelon for dessert. 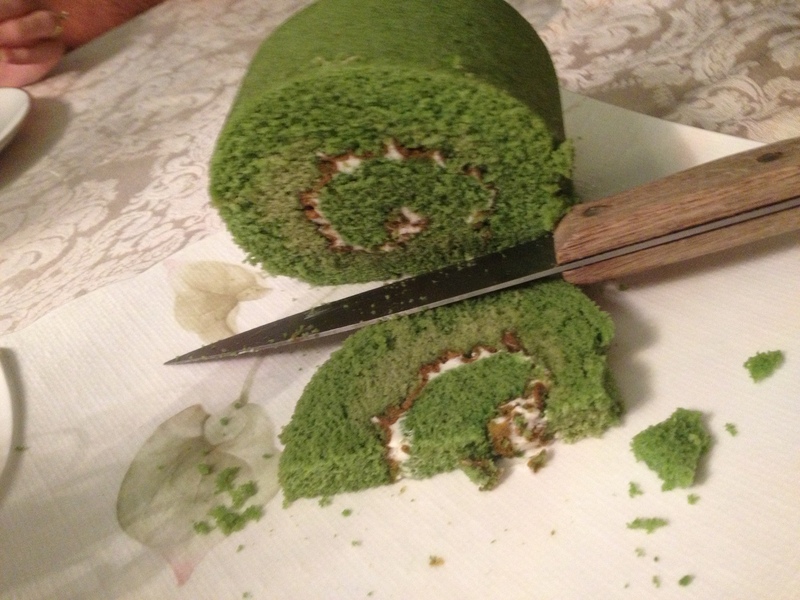 Our dessert was watermelon, Asian pear and a matcha tea roll cake. They were nice and light sweets after a full meal. How do you spell spelt? Spelt is an ancient grain that is a distant cousin to wheat but existed centuries before. 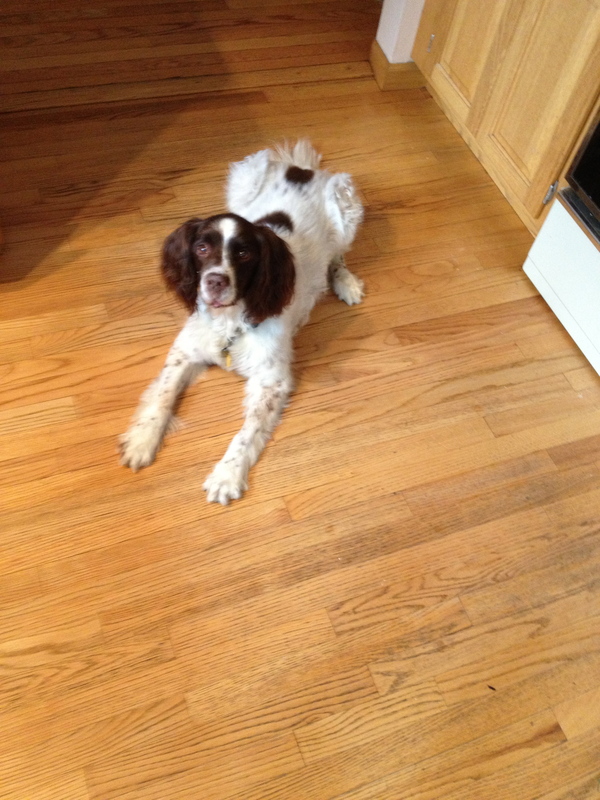 Hmmm…How did I stumble onto spelt? Well I have experimented with my diet of late. 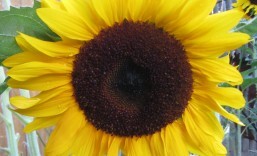 My hairdresser told me about the Fast Metabolism Diet (FMD) and how she, her sister and mother had lost weight. She said it was quite healthy, so I had to check it out. The FMD rotates in three phases by which to eat certain foods that will speed up your metabolism. My summary is this: you eat every 2-3 hours, no dairy, no flour, no soy, no corn products, no alcohol, and no sugar. You eat a lot of veggies, protein, drink lots of water and eat moderate amounts of fruit, oils, healthy grains like steel-cut oatmeal, quinoa, brown rice, or spelt. I’ve lost 5 lb. I’d like to lose 15 more, but I’m still working at. It is hard to go from semi-healthy eating to completely healthy habits in a month. 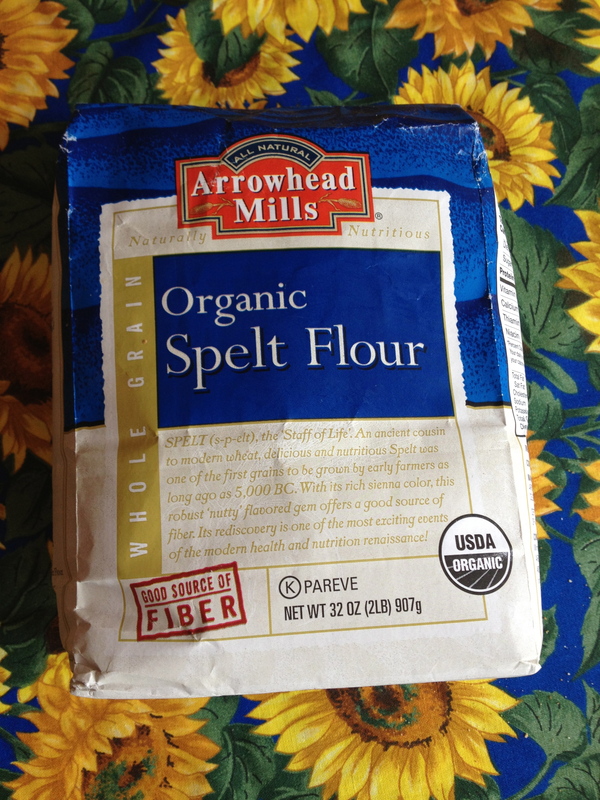 Anyhoo… I had to try a spelt recipe since I had never heard of it nor made a recipe out of it as yet. 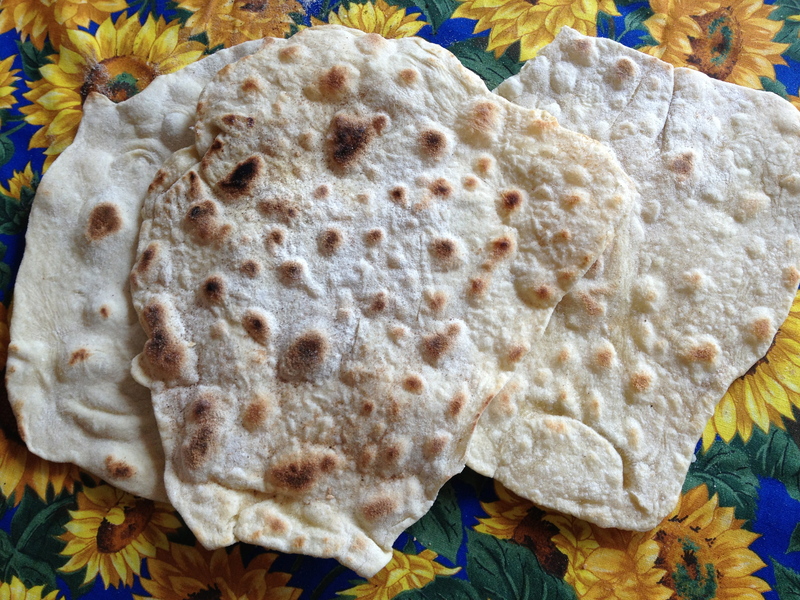 I was looking on Pinterest.com and came across Homemade Spelt Tortillas from fellow WordPress bloggers The Adventures of Z and K.
Mix oil,salt and spelt flour together then mix in water a little at a time until incorporated, but not too sticky. Knead for 1-2 minutes, Rest for 20 minutes. Cut the dough into 8 pieces with a pizza cutter. 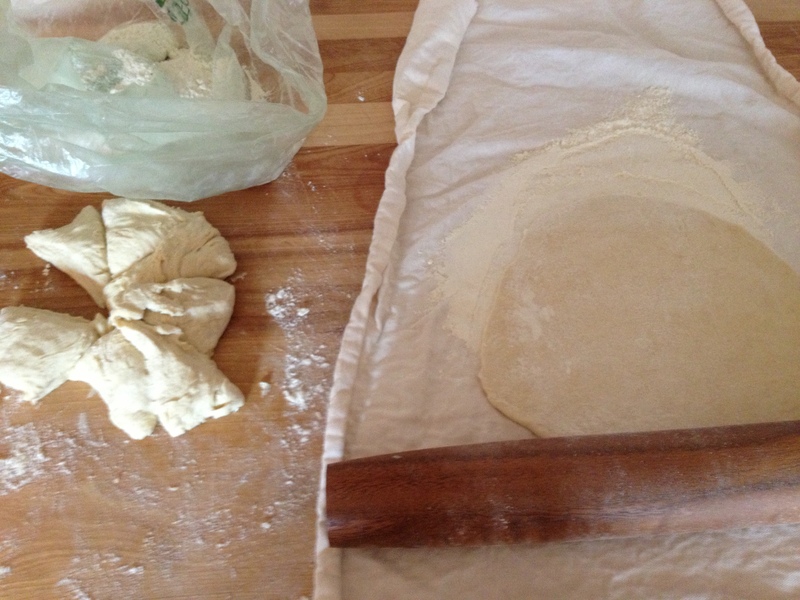 Roll out, flour the board or pastry cloth if it is sticky. Heat a non-stick pan and brown for 1-2 minutes on each side. 1. Spelt is not gluten-free. It is a cousin of wheat but people with wheat allergies do not have the same problem with spelt. 2. I found it easy to work with just like regular flour. 3. I heated up my pan initially really on high but had to turn it down to med-low, so as not to burn the bread. I found that 1 1/2 minutes on each side was perfect. 4. The hubby and dog loved the flatbread.